Welcome to the “Just for You” blog series, friends! This series will highlight different dress styles every month, just for you and the look you want for your special day! I will highlight 5 gowns that fall under different styles each month so you can get a glimpse of what we have for you! This months highlighted style is for all of my Meghan Markle loving, simple, classic, and timeless girls out there that want a modern flare to their dress! 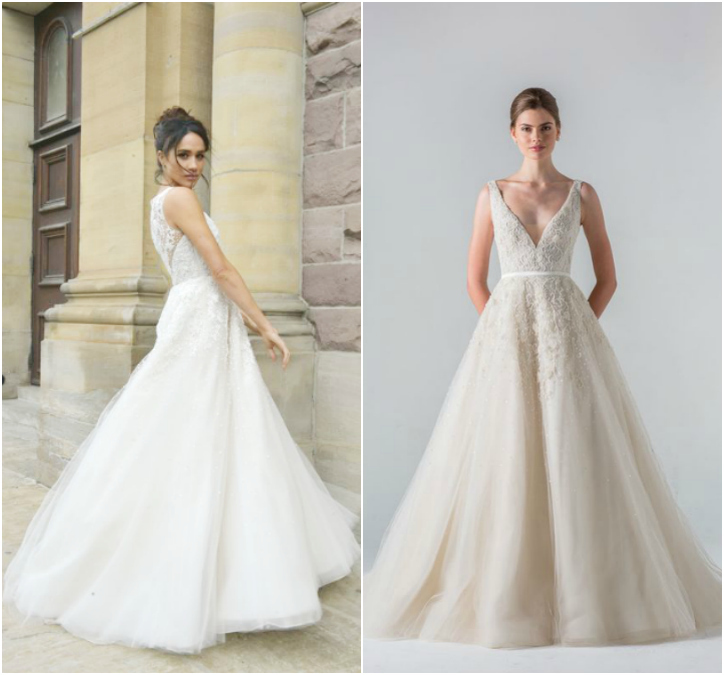 The simple chic style of these gowns are some that you would have seen popular 10 years ago and you will still see them 10 years from now, which is another reason we love them so very much. I just know you’ll be in love with these gorgeous dresses just as much as we are! First up is this beautifully elegant Jenny Yoo dress, “Amelia”, with a knit crepe bodice and tulle skirt. This is a unique take on a classic ballgown silhouette. With the sleeves falling just off the shoulder, it gives a sweetly modern flare to a timeless look. The defined waist gives way to soft romantic layers and a sweep train. Added bonus? It is SUPER comfortable for that long, worthwhile day! This gorgeous mermaid style dress, “Monroe” by Blue Willow is a great option for my girls that want to rock the fitted look. The ruching of the satin fabric is great for giving you the structured hourglass figure, while the horsehair lining of the tulle gives the skirt just the right amount of body. Another Jenny Yoo, “Spencer”, features a plunging v-neckline bodice with illusion tulle and a dramatic circle cut silhouette in a soft and elegant luxe taffeta. The illusion cutout side panels give a modern and unexpected detail, while the skirt is so light and airy that you’ll be able to dance the night away without any heaviness of a skirt weighing you down! If you’re looking for an elegant ball gown with the flare of off the shoulder sleeves, this Martina Liana is the dress for you! The way this skirt lays is absolutely breathtaking, with buttons all the way down the train (but you’ll have to come in and see us to take a look at that feature ;)) An added bonus? The sleeves have an elastic band inside- meaning you won’t have to worry about tugging at your shoulders to keep them in place all night! Last, but certainly not least, we have this gorgeous fit and flare gown by Blue Willow, “Walker”. 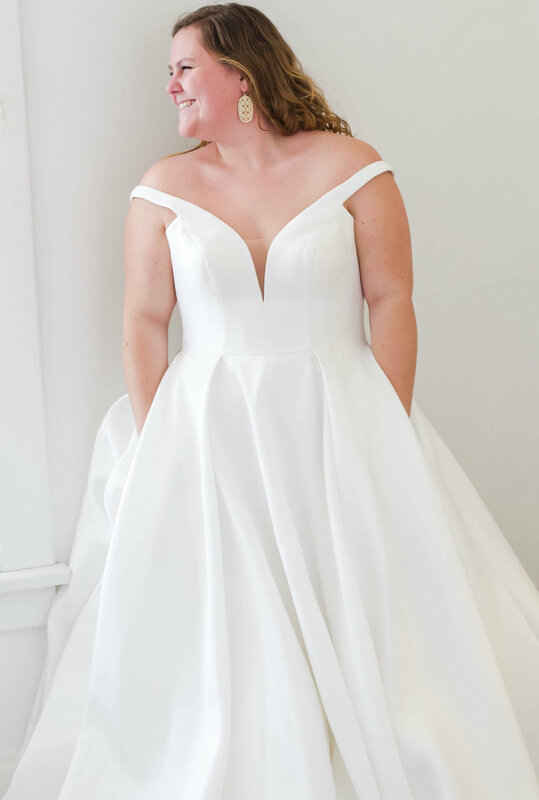 This pointed strapless bodice with a trumpet skirt of textured organza fils coupe is perfect for the bride who wants to add a bit of flare to their classy wedding dress. Thank you for taking a peek into only a small fraction of the modernly classic dresses we carry at Twirl! If you’re interested in coming in to try some of these beauties on, send in an appointment request or give us a call and we can set something up for you! Come back next month as I show you a portion of the gowns we have for our more rustic brides! Can you give us a glimpse into you & your hubs's love story? Chris and I met at Penn State where we both went to college. We started dating around graduation of our senior year (terrible timing). At that point, I had already accepted a teaching job in northern Virginia and Chris had been accepted to medical school at Penn State Hershey. We decided to give it a go and ended up spending the first four years of our relationship in different states! We spent practically every weekend traveling back and forth to visit each other. In June 2015, we moved to Louisville for Chris' job. He proposed that same Thanksgiving at my parent's house back in Pennsylvania. We got married this past June and have been together now for over 6 years. We currently own a house in Louisville and live there with our rescue pup, Hailey. Once we got engaged (or let's be honest, before then) I started looking at dresses online. I came across the Tara Keely dress and feel in love with it online. I loved the lace, the sleeves and the pockets. I tried on wedding dresses a couple of months after we got engaged and found some I really liked, but couldn't get that dress out of my mind. I knew I couldn't find my dress until I tried on that dress. Twirl was actually the only place that carried that specific designer. A year before the wedding, my mom, sister and grandma came down for dress shopping. We went to Twirl on our second day of shopping. I feel in love with the pink house, the decor, and everything about Twirl. Haley, who helped us, was amazing and so thoughtful. We saved my dress for last and as soon as I put it on, I knew it was the one. I loved all the details and the fact that it wasn't as common. Everyone agreed that this dress was their favorite. I actually didn't say yes until the next day. I went to one more place, but nothing compared to that dress. I am so happy I went with my gut and found that one dress. 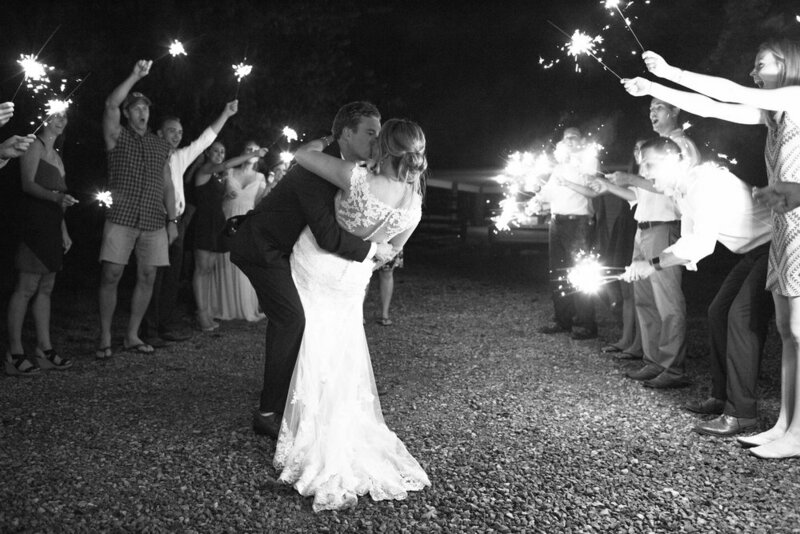 What is your favorite memory from your wedding day? There are so many! Chris and I didn't do a first look so seeing him as I was coming down the aisle was my favorite. I wasn't nervous until that moment. It's honestly true that in that moment you forget about all the other people. Another favorite memory was the ceremony. My cousin's husband, Christopher, married us. When I was in 5th grade, I was a junior bridesmaid in their wedding. He also wore the tie that my late grandfather wore to their wedding. It's a tie that symbolizes him and was been worn to all of the cousin's wedding. To have him there in spirit, meant so much to me. It was also wonderful to have so many of our family and friends travel to Louisville. Most of our guests had to travel and to be able to have everyone in one city for one weekend was an amazing feeling. Our band, Kudmani, was amazing and had everyone on the dance floor, which made the night that much more fun! What has been the best thing about marriage so far? It is amazing getting to say that Chris is my husband. We now get to make joint decisions about things like house projects and travel. I also love knowing that I get to spend everyday with him. Any pieces of wisdom or advice you'd like to share with future brides, engaged gals, or newlyweds like yourself? Have fun and enjoy all of these moments. It's so easy to get caught up in the stress of planning a wedding that you forget to enjoy being engaged. Having a long engagement helped me feel like stressed. Chris and I also make sure to make time for each other. He works a lot of house so the time we get to spend together means a lot. We met initially in the summer of 2011. I had been invited to a youth group by a friend at Nathan's church. When I met Nathan, he had long, curly hair and was very reserved. He went off to college shortly after we met-- he was kind of a mystery! After many youth gatherings together and trying to be quiet about it, I knew I had fallen hard for the quiet, curly-haired boy. Over the course of a few months we grew closer and closer and I was smitten! We weren't officially in a relationship until 2013. We instantly ventured into a long-distance relationship when I went off to college that Fall. It made the early stages of our relationship difficult, but I will always cherish the butterflies and anticipation that filled me up every week before I saw him again. Loving Nathan has been the easiest thing. He is kind and encouraging. Keeps me in check with the Lord. He is honest, holds me accountable, and listens. Over the years he became my best and truest friend. Finally, in April of 2016, we became engaged at the same place where our relationship started-- our sweet church! Nathan planned the sweetest engagement. I get giddy just thinking about it! We were engaged and planned our wedding day for a little over a year. 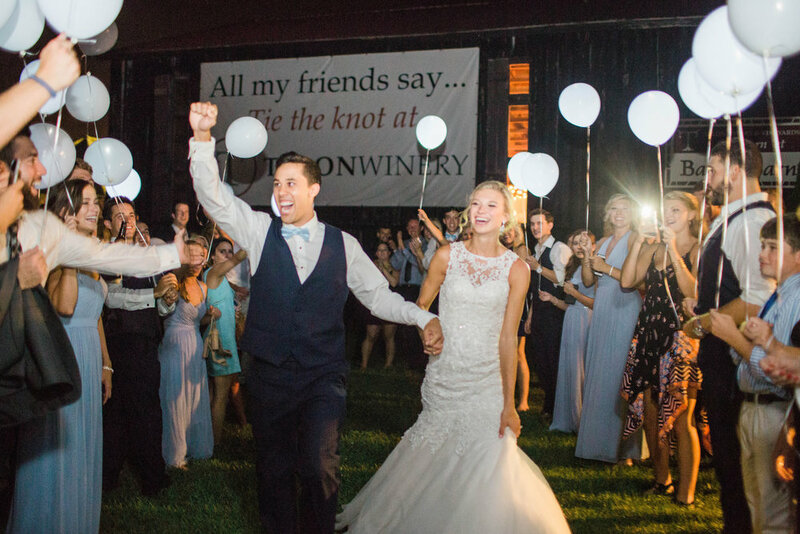 We tied the knot in the same sacred place as all of our major milestones-- our church! I have always been a simple person that doesn't like a lot of attention. I feel most beautiful when I am modest and honoring my God with my actions, words, and what I wear. So when my wedding dress hunt began, I knew I was on the hunt for subtle, modest elegance. I also knew I wanted lace. Lots and lots of lace! So I went in with an idea, but kept an open mind. 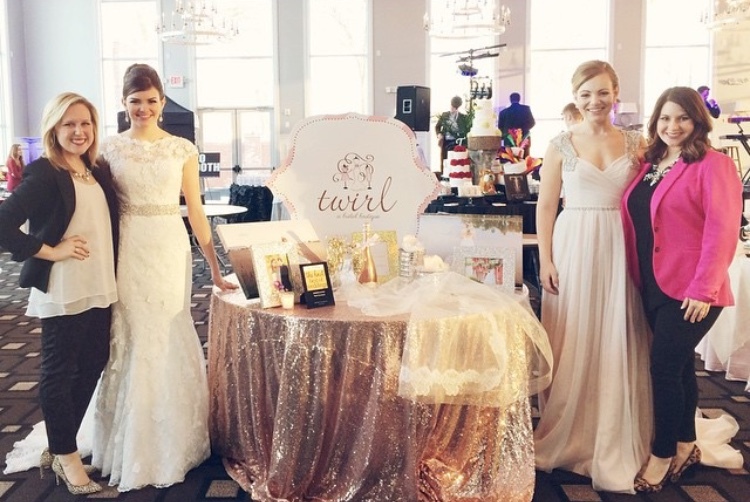 I absolutely loved my dress shopping experience at Twirl. I wanted to try on every dress in the store! So I picked out a bunch of dresses, but with every dress I put on, I always went back to "the one" -- my dress. One of my favorite things about shopping at Twirl was the personal environment. It was intentionally not crowded and was so intimate and inviting. I felt attended to, special, and important while shopping for my dress. 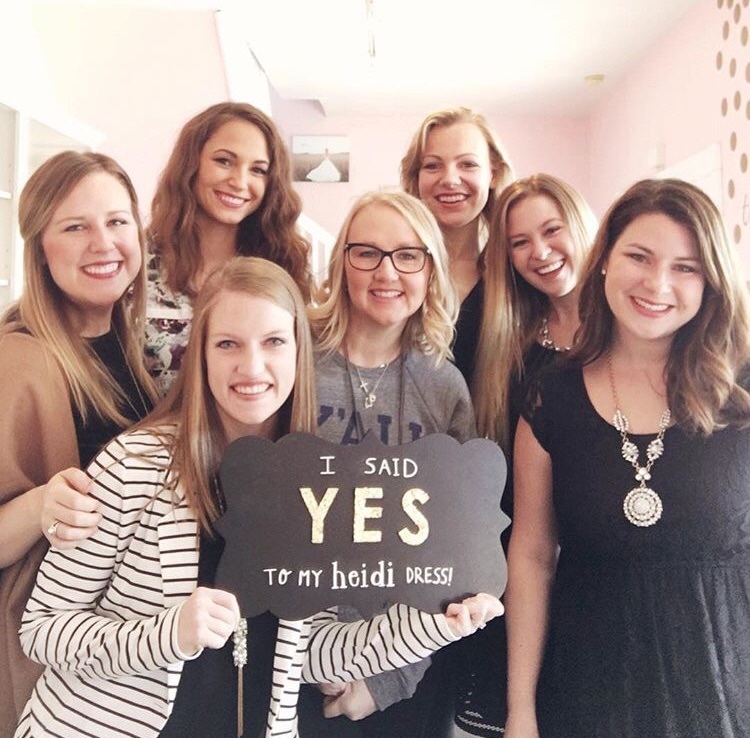 My consultant, Haley, was so sweet and truly listened to all my requests and helped me overcome my indecisiveness. It was the best experience! Like I mentioned before, the every day things have been my favorite part of marriage so far. I love coming home to Nathan (and our sweet puppy!) at the end of a long day at work. I absolutely love to cook dinner for him, especially when it's one of his favorite meals. I of course want to impress him! I love praying with him before every meal and I love finally being able to fall asleep alongside him at night. Going to our new church together on Sundays has been the highlight of my weeks for months now! The Lord has blessed us abundantly and it has been so fun to be able to be blessed and bless others together. I love doing life with him! I think that it is so important to determine what is most important to the two of you on your wedding day and work the hardest on that. Nathan and I both love the Lord and established early on that our main goal for our wedding day was to glorify God-- in everything. 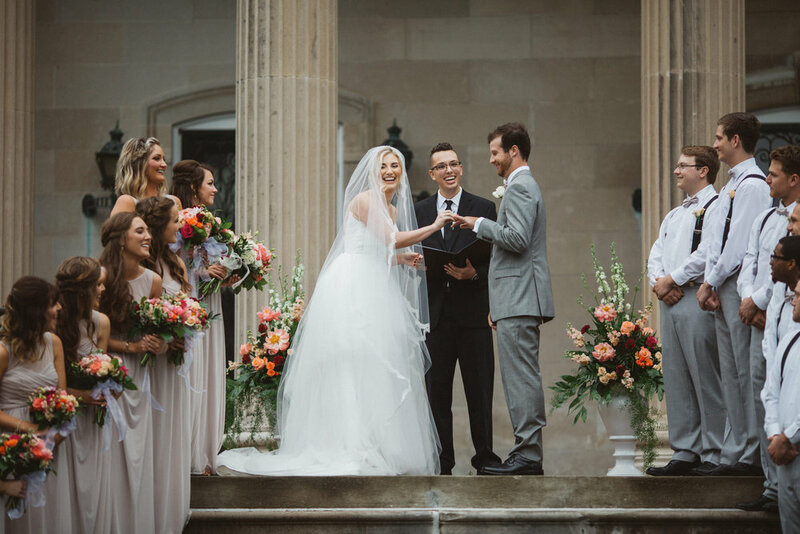 We wanted our first acts as husband and wife to be in service to each other, we wanted the Lord to be in the midst of our ceremony and help usher others to feel His presence on our wedding day. I spent countless days stressing over flower orders, chairs, vases, logistics, and lists, but no one remembered that at the end of our day. What people commented on the most was the presence of God and spirituality of the ceremony. We want our lives to be living testimonies to the love of our God, and we wanted our wedding day to fulfill that same purpose. That was our goal. So before you jump head first into wedding planning, establish your goal for your wedding day and make that happen. What do you want people to remember when your day is over? Whether it's intimacy, Godliness, having a good time, having the best party, or just keeping it simple, figure out your goal and make it happen. Everything else truly does fall into place. When Tyler and I first met there was no way I ever thought I would date him. I told him from the beginning that I only wanted to be friends, well I guess he took that as a challenge. We hung out all the time and did what best friends do, we liked to go eat (all the time) we stayed up late talking on the phone, went places together, and our friendship grew stronger each passing day. He told me he almost gave up trying to make me his girlfriend but I’m so happy he didn’t because we would both be missing out on our happily ever after. What was it about your dress that made you realize it was "the one?" Was it what you expected to love/wear? Favorite memory from dress shopping/Twirl? 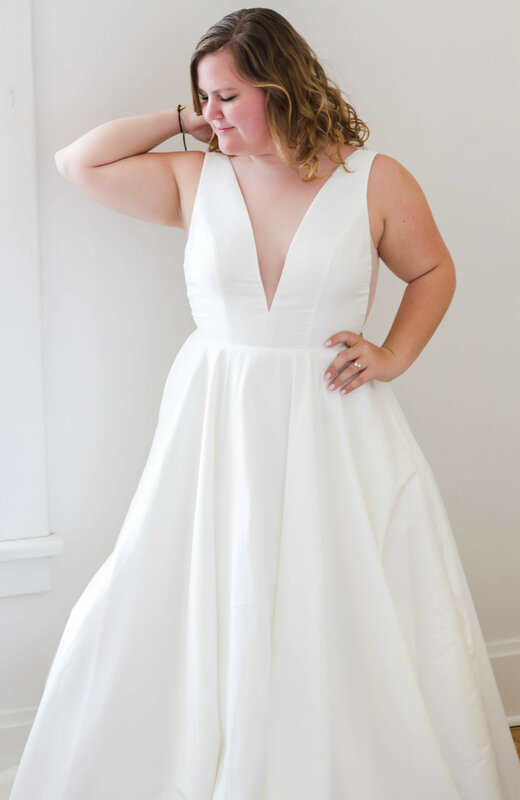 When I first tried my dress on I was a little skeptical, I had a completely different style in mind but the longer I looked in the mirror the more I fell in love with it and knew it was the one! My favorite memory of dress shopping is my sweet grandmother was there to share the experience. She passed before seeing me walk down the isle so I’ll always cherish that day of her seeing me in my dream dress. My favorite part of the wedding is having all our family together. I have four brothers and a sister spread out all over the country along with my nieces and nephews. So getting everyone together is a pretty hard task, I’m so lucky to have a loving and supportive family to be there for our biggest day ever. The best thing about marriage thus far is simply being together. Learning about one another, to lift and support and be the others rock through it all. Already in two years we have experienced so much, graduating college, new jobs, buying a house. So many milestones that really shape us and help us grow as a couple. I learned a lot while planning a wedding. Like everything isn’t going to go just as planned, you may plan for sunny skies and instead get some rainy clouds. Try to not sweat the small stuff and know everything will happen just like it’s supposed to. Enjoy the day because it goes by so quickly. I so badly want to relive the day I got married because it was such a magical day, so take my advice and just live in every moment. And if you have rain clouds on your big day I suggest to have a backup Pinterest board with some awesome picture ideas because they’ll turn out beautifully. TOOLS WE LIVE BY + BLACK FRIDAY DEALS! We hope everyone had an AMAZING Thanksgiving!! We hope you spent time with the people you love most, counted your blessings, and ate till your heart’s content! As you know it’s BLACK FRIDAY and a couple of our FAVORITE brands are having INSANE deals today that we want you to know about!! These items RARELY go on sale any other time of the year so now is the time to get them when they’re such an amazing deal! We LIVE by our Powersheets and they have totally transformed the way we do life & business. They help us really shift through our priorities, dream with intention, and cultivate what truly matters in both life and business. Powersheets & a ton of other incredible products are on CRAZY sale today through Cyber Monday and we’re thinking you should snag some for yourself or people you love! We have our eyes on the brand new Celebration Binder & are excited to get it for us and some of our favorite people for Christmas this year!! You all… THESE ARE NEVER ON SALE!!!!!!!! That should be enough of a reason to get yours today! Pluuuus, once they’re gone they’re gone. 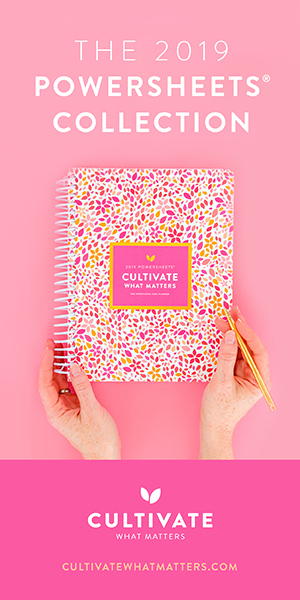 These planners are a fan favorite throughout the entire Twirl team and we range from a college student to a momma of two! It’s simple, beautifully designed, and helps you keep life as organized as possible. We’re HUGE HUGE fans & know y’all will be too! There are also a ton of other fantastic goodies in the Simplified shop so grab them while they’re hot and ON SALE!!!! CLICK HERE TO SHOP ALL THE SIMPLIFIED PRETTIES! Our besties over at Seed & Harvest just launched TODAY their INCREDIBLE social media content calendar! We know that creating content for your social media platforms can be every business owner’s pain point. Well, the ladies of S&H HEAR YOU and are here to help!! They want to help you focus on what really matters (running your amazing business out of a place of abundance) and take away the stress of creating meaningful, engaging content. Good content is how we grow but it can be so hard to create sometimes. The ladies of S&H have created this content calendar to help you clarify your heart to your audience and engage with them in ways that build connection & ultimately help your business grow. It’s a win/win across the board! We have used this calendar for months now & it has brought so much balance and peace of mind to our lives. We have watched it grow our business in amazing ways and we’re excited to watch it do the same for yours!! The S&H gals are amazing and gave us a discount code for our amazing Twirl Family!! So yes, welcome to the tools that help us live out of abundance (the best we can). HAPPY SHOPPING, loves!! Leave a comment & let us know if you purchase any or all of the above! We’ve love to cheer you on & celebrate you choosing abundance over chaos. XOXO! Zach and I have been together since we were 17. When we first starting dating, I knew he was the one I wanted to spend forever with. We went to high school and college together. Soon after college, we took a family vacation, with both his family and mine. We were out on a sail boat when he got down on one knee and popped the question- I WAS SHOCKED! First off, wow he planned this proposal all by himself? Props to him! AND he hid a ring from me!? Double props. 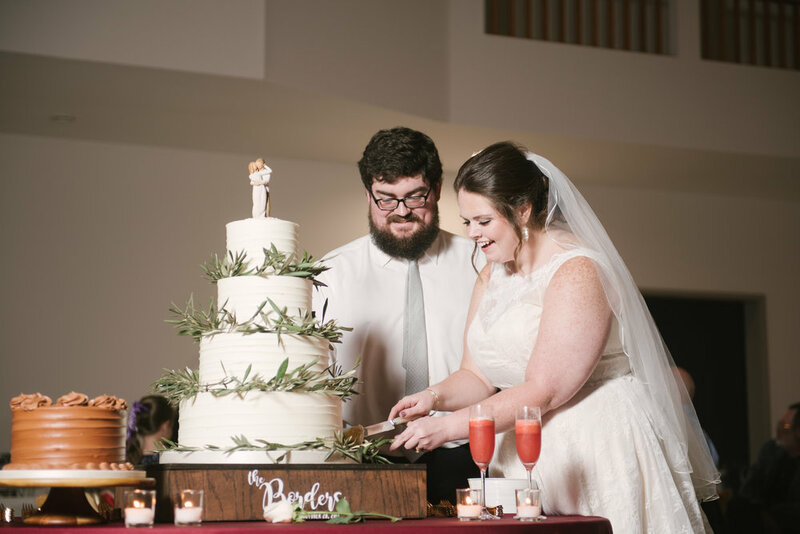 I was so excited to become his wife! Being his wife truly is the greatest! He has been the best thing that has ever happened to me. He is the most kind, gracious, and loving person. He never fails to make me laugh and he encourages me to see the best in everything! 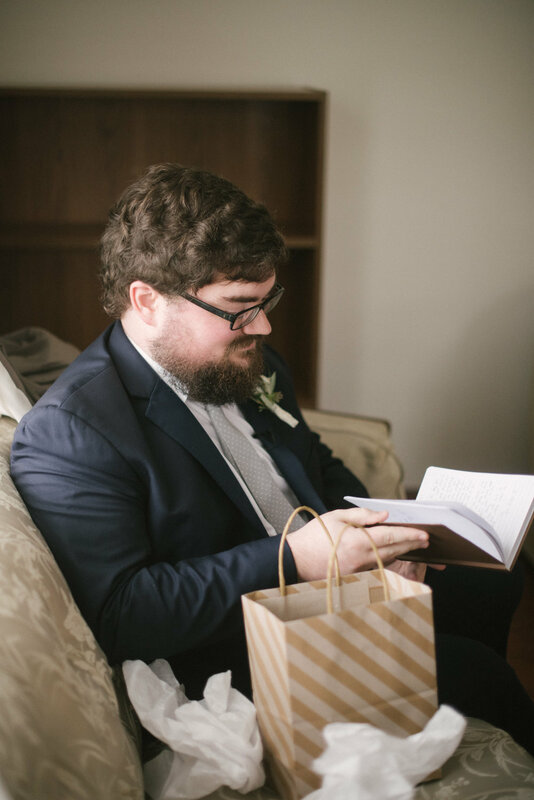 The months leading up to my wedding I was a planning machine; everything had to be done. However, my dress was the one thing I hadn’t gave a lot of thought to. In my mind, I could envision what my day would look like, what flowers I would carry, and even what the cake look like; but I could never see what I would be wearing. My mom and I decided to go to Twirl to see what we could discover. To our advantage, we walked in and the ladies were so warm and welcoming. When the consultant asked what I had in mind for the big day, I told her nothing in particular. I knew what I didn’t want, so we just went from there. I tried on 5 dresses before I found the one. As I slipped the dress on, I could feel it; this was the one. I walked out to show my mom and without any suggestion, she knew right away too. As I looked into the reflection of the mirror, for the first time ever, I could see myself as a bride. This was it, the dress I would become a wife in. The whole experience was magical and it made the day even more special! 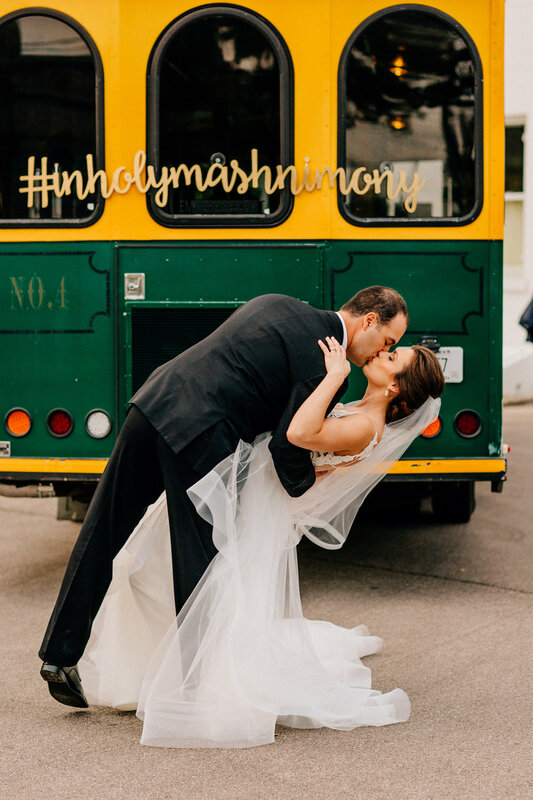 I actually have three favorite memories from our wedding day! As we arrived at the barn early the morning of the wedding, I felt such sense of peace knowing that this long awaited day was finally here. 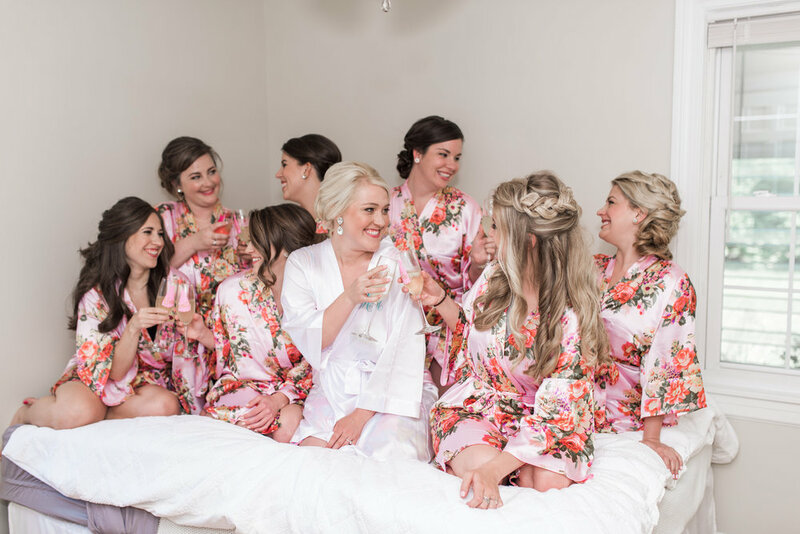 As my bridesmaids were getting their hair and makeup done, I sat and watched everyone’s interactions, their laughter and conversations; this was it, our wedding day. I got a text from my brother telling me how proud he was of Zach and I and how much he loved the two of us. At the end of the message he said, “Oh yeah and one more surprise will be coming your way.” I had no idea what he was talking about, but moments later I received a video from him. It was taken the morning of mine and Zach’s engagement. Zach was telling me how excited he was to marry me and how nervous he was to propose! It was such a kind gift, one that calmed any nerves that I had. 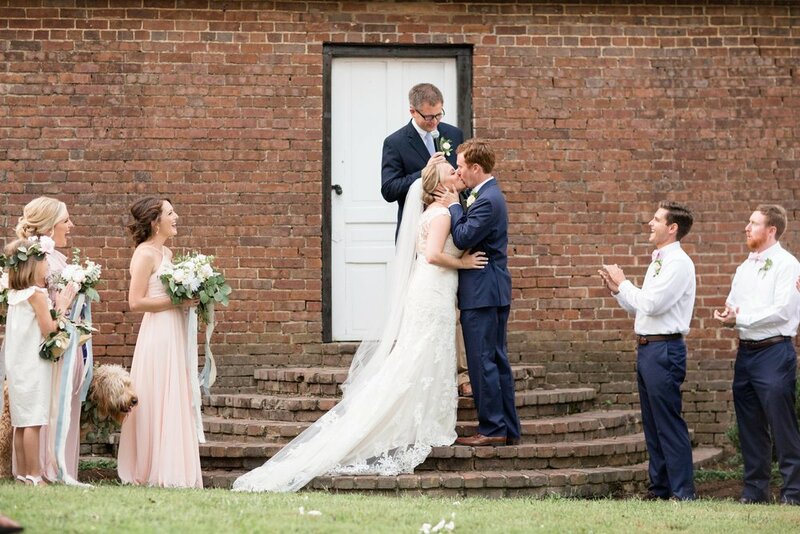 Another special moment for me was seeing my groom for the first time as the farmhouse door opened. It was such a surreal moment, walking down the isle to your husband. In that moment, I didn’t see anyone or anything but him. My last favorite moment of the day was our first dance as husband and wife. We chose a song that meant a lot to both of us and that represented our relationship with Christ. As we danced, time seemed to stand still. I can still picture that moment. The BEST thing about marriage so far is just being with one another! It brings me so much joy knowing that regardless of how my day has gone, I get to come home to a loving, kind-hearted husband who never fails to make my days wonderful. He truly is just the sweetest! My best piece of advice for any future bride is to enjoy the day, it really does fly by! But also know that this day is leading up to something so much greater. It’s leading up to your marriage, so spend more time preparing and praying for that. Can you give us a glimpse into your & your hubs’s love story? Kelby and I actually went to middle and high school together. In the 8th grade I was a cheerleader and he was on the basketball team and during a game one night, he came flying down the court and just didn’t stop! He completely knocked me down in front of everyone! After that we always knew of each other, but never really hung out much. All I knew is that he was so cute and he sat behind me in history class junior year. I was dating someone at the time, but the way he tells the story is that he liked me, but knew he had to be patient because in his words I was “marriage material.” Fast forward to freshman year of college at UK, we are both single and our friend group was a very tight knit group hanging out at Kelby and the boy’s apartment every weekend. He was my New Year’s kiss that year, but we didn’t want to ruin our friendship and make things awkward for the group so we just stayed friends. A year and a half later, Kelby plans this bonfire/party at his house for everyone and tells his best friend that he is finally going to tell me how he feels. Well, he does and since I had a crush on him since freshman year the rest was history. We dated for two years and got engaged on our 2-year anniversary at Talon Winery where we would later have our beautiful wedding reception! My dress was one of the first dresses I tried on. It was only a week after I got engaged and I had my mom take pictures of all of the dresses, so I could look at them if I couldn’t decide. Something about that dress, I just couldn’t stop looking at the picture of it and the lace detailing was just so beautiful and a lot like what I envisioned myself wearing. I went back for a second appointment and no other dress came close to it, you really do get this warm/fuzzy feeling inside when you realized its YOUR dress! I still love looking at my wedding pictures because my Twirl dress was so perfect for me! 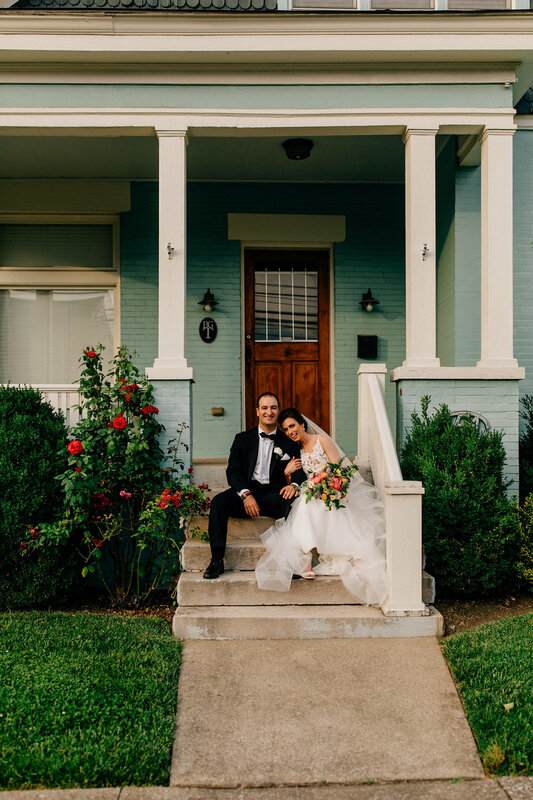 I loved coming home from our honeymoon and staying together in our new house for the first time. It was so fun to learn the dynamic of living together and actually being husband and wife in real life after the honeymoon. I also really enjoy cooking and having dinner together every night; it’s the small things. I have loved every minute of being his wife through the happy and difficult times. Having him as my partner in life is the best thing ever! I tell all my friends who get engaged the same thing, take in every second! I was engaged for almost a year and it flew by, our wedding day flew by and now here we are a little over a year after our wedding and I’m asking myself, where did the time go? Even though planning a wedding is stressful, I wish I could go back and do it all over again; it’s such a special time in a girl’s life! So don’t take anything for granted and enjoy every minute of planning and your big day! 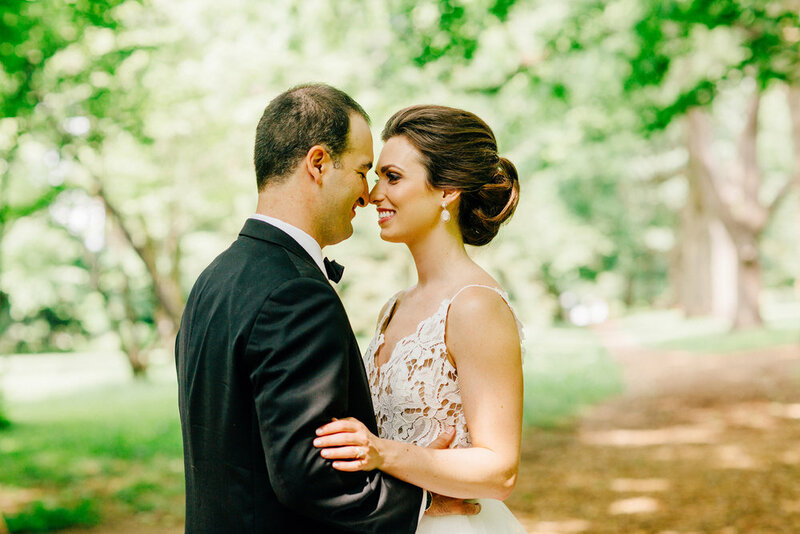 Friends, we are so excited to share this GORGEOUS wedding with you all today! 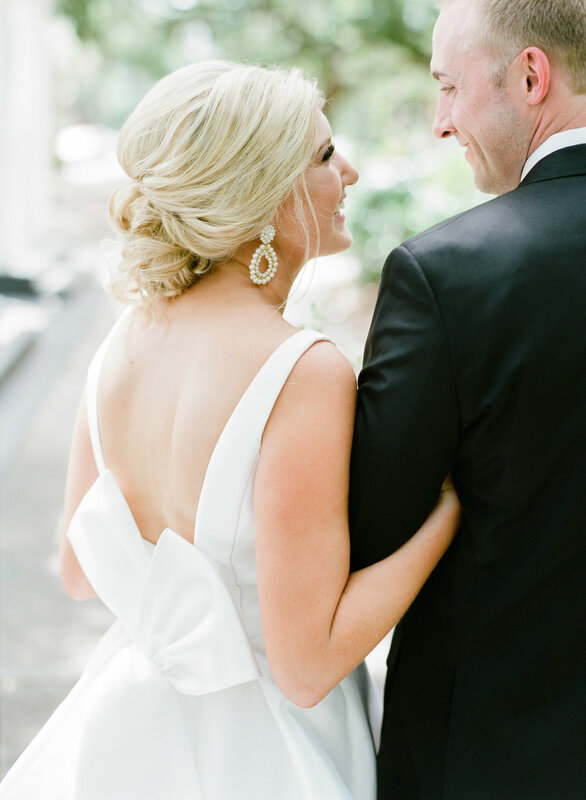 Katie and Dave tied the knot in Savannah, Georgia and it was every bit of Southern perfection that you could have imagined. We're so grateful they allowed us to share their special day with y'all! Enjoy!! Dave and I met in 2015 through mutual friends. Although we were not aware of each other before we met, our families go way back. Our grandparents were neighbors in the 1950’s. My grandparents moved to a new address, and 20 years later Dave’s parents moved in next door to them. That is the house that Dave was born in, and my grandma recounts funny stories of Dave being a toddler next door. We knew Dave’s cousins growing up, and in middle school I had Dave’s mom as a teacher! It’s definitely a small world, but as soon as we met we hit it off and have been inseparable ever since. I am very particular when it comes to what I wear, and I had a look in mind that I had not been able to find anywhere else. I knew I wanted a clean white silk dress with a bow on it, and was becoming discouraged that I wouldn’t find what I was looking for. We live 3 hours away from Twirl, but I’d heard good things and wanted to come check it out. I tried on just a few gowns, but as soon as I slipped on my dress I knew I’d come as close to what I’d imagined as I was going to find. My mom got so excited, because she knew it was the one too. When the dress came in in my size, that is when I really got excited because I could see it fitting like a glove from all angles. The day of the wedding, the dress exceeded my expectations and I felt so beautiful in it. Everyone who saw the dress said the same thing, “It’s so you”. I loved Twirl because of how intimate it was. Other salons I went to had a lot of other brides with large parties in attendance that would watch me try on dresses too and give their opinions. Twirl was just much more of a boutique vibe, and everyone was so friendly. My favorite memory of our wedding day was simply seeing all of our family and friends in one place. I am not very emotional, but when I turned to walk down the aisle I burst out in tears - happy tears of course! It was just so wonderful having so many people who love us there to support us in our marriage. The best part of marriage so far has been simply knowing that we’re a team, and we’re going to experience life’s highs and lows together. Here are a couple of things! 1. 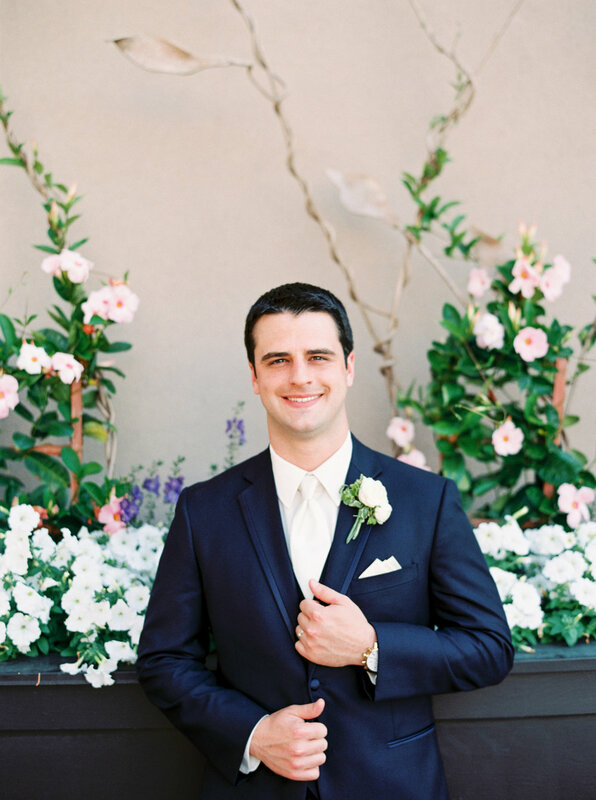 If at all possible, have an experienced wedding coordinator. This can truly take so much stress off your shoulders. We live 8 hours away from our venue, and had our coordinator the month of. I didn’t have to worry about anything vendor related leading up to the wedding, and the day of had 0 headaches. I simply got to enjoy the day. 2. If you’re planning any part of the wedding outside, have a back up plan. I am so thankful that we had thought of a back up plan when we booked our venue. 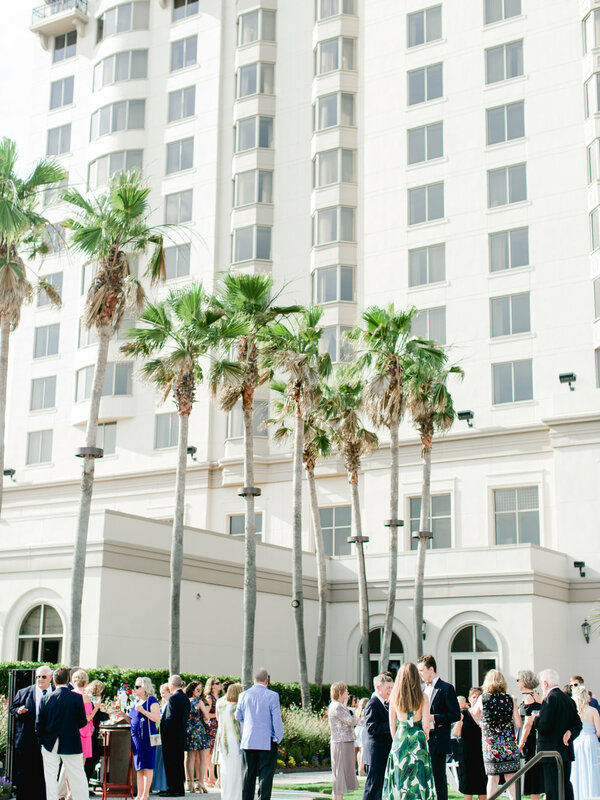 Out of all the weekends in the year, a tropical storm (before hurricane season) was descending upon our venue, making my plan of an outdoor ceremony and part of the reception outdoors in jeopardy. We are so lucky that the weather cleared shortly before the ceremony and we were able to have that and the cocktail hour outside. Since the weather was so iffy, we elected to move the reception indoors and that turned out to be perfect. I don’t know what I would have done if we didn’t have the other options in place! 3. If you’re having a plated dinner and need to know who is having what dish, make sure to include in the response card (in addition to them checking chicken/fish/veg/etc) for each guest to initial beside the meal they are having. 4 people out of 180 guests initialed their meal, and the rest we had to contact or guess who wanted what! 4. For picture purposes during the ceremony, make sure you all know exactly where you’re standing at the alter. 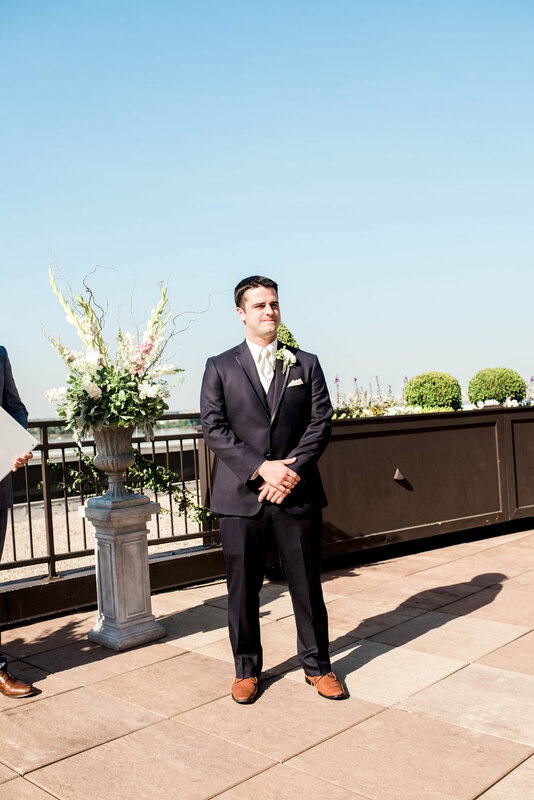 Myself, the officiant, and my husband are all a little off center. 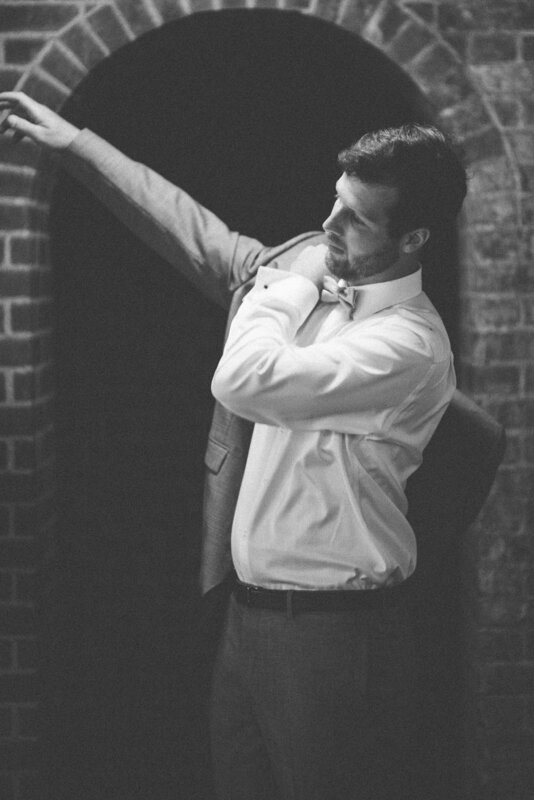 At the time we didn’t notice, but in the wedding pictures I definitely do! How much time do you have? Wet met for the first time at Troll Pub in March 2012. We were both with two different groups of people so it was mostly an obligatory introduction. Then when Zack got hired at Doe-Anderson advertising agency (where I was already working) in the fall of 2012, it dawned on us that we had met before. Later that year, we started dating and I couldn’t believe that I had agreed to date a co-worker. From there, our life progressed in the easiest way and over the last 5 years, we’ve endured break-ups, long-distance relationships, job changes, loss of grandparents, a new apartment, a puppy and more. There’s nothing we can’t tackle together. I tried a lot of dress on to ensure I had checked off what I did and did not like, but very early on, I knew the shape, style and designer of dress I wanted. Once we found the perfect combination of bodice and skirt, it was an easy decision. Twirl had a great selection of Hayley Paige and I wanted to buy all of them, but the experience at that shop was so stress-free it made it easier to finally pick my dream dress. It’s honestly too hard to pick one moment, but I will always remember the feeling when I got to see Zack during our first look. It was such a big day for us as a couple and I missed being with him in the morning and sharing with him, so when we were able to connect, it made the day feel that much more real. It was also a very special moment seeing the final tent with just Zack and I before the ceremony began. It was a private moment for us to take in the reality of our vision and the fun we were guaranteed to have in this space. It blew us away how beautiful and perfect it all was. 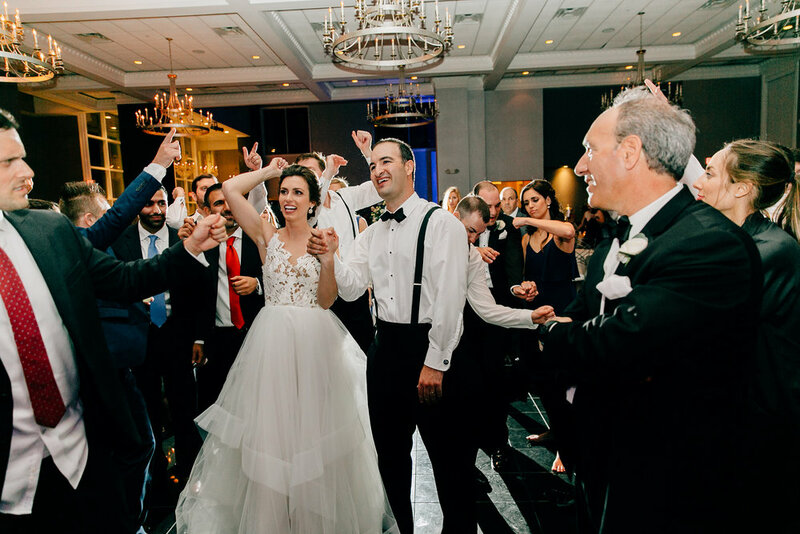 The other standout moment was when we begged our DJ to play one other song and he picked “Friends in Low Places” and all our guests joined us on the dance floor and sang and danced with us in a circle. It was humbling to know all our friends and families were here for the two of us. Not planning and spending money! Life hasn’t been that much different for us on a day-to-day basis, but I enjoy saying I have a husband and I love to see Zack’s wedding band. The commitment we made to each other is real and forever and that’s the best and the part that lasts the longest. Be present in every moment related to the celebrations of your wedding and engagements. On the wedding weekend specifically, continually remind yourself to take a break to appreciate and enjoy what’s going on around you. I was worried that after the day, I would have the post-wedding blues, but because we were conscious throughout the whole weekend and reminded each other to take it all in that at the end, we only felt so happy and loved. We were proud of all the moments we remember and how we felt during the day. Those are the feelings that are sticking with us forever. 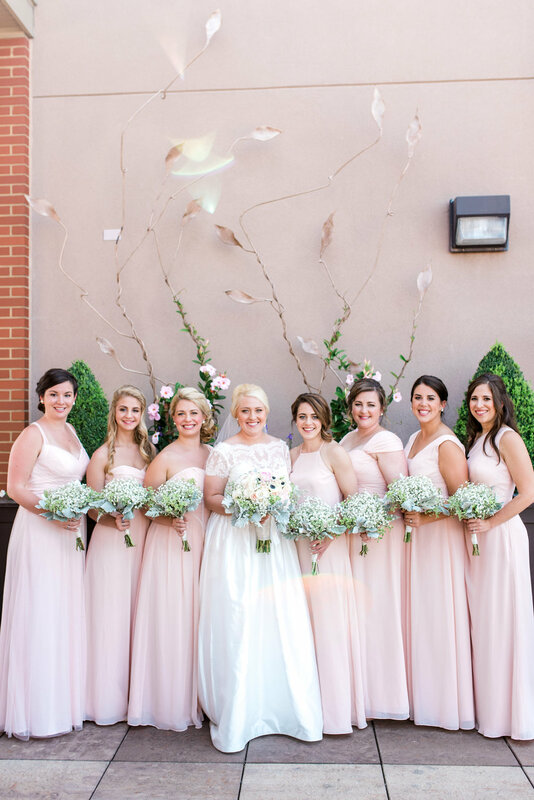 We adore this sweet bride to pieces! 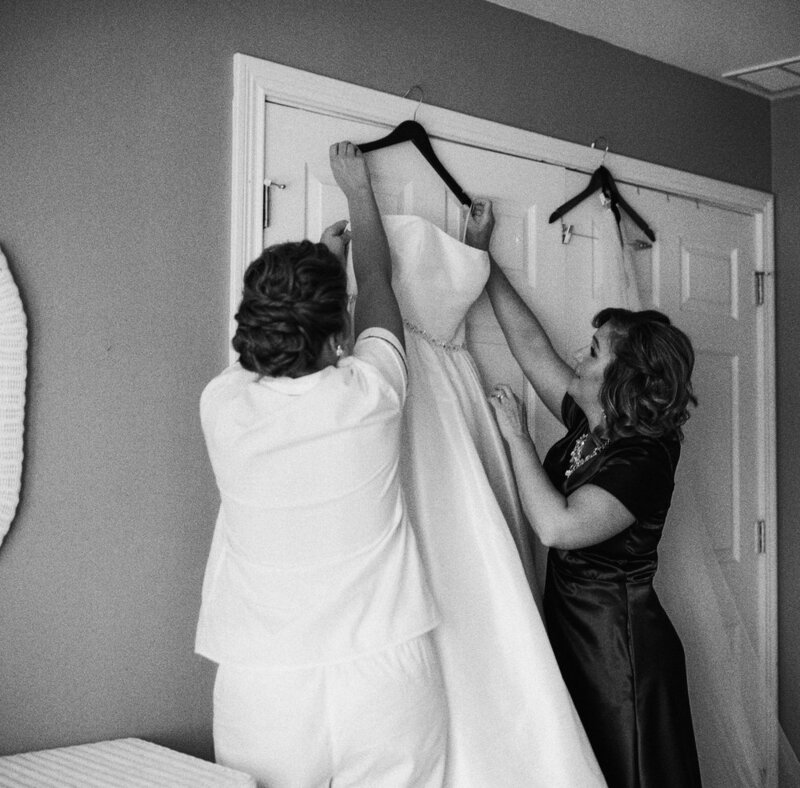 Mary was one of Ty's babysitters and so when it came time for her to shop for her wedding dress it was such a special time. We remember her appointment like it was yesterday. 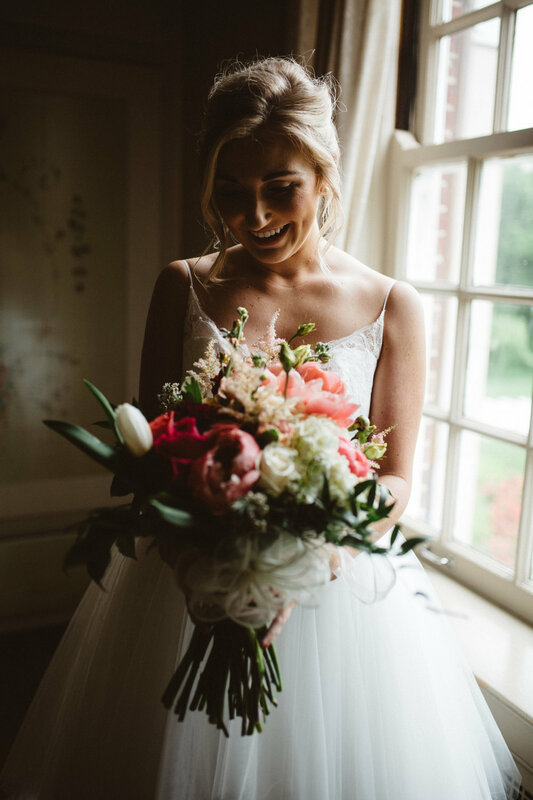 So many happy feelings and to be able to see her pure joy on her wedding day in her perfect gown makes our hearts the absolute happiest! Enjoy reliving their precious day with us. We love you Mary & Chris! Cheers to your beautiful life together. Xo! Chris and I met the year I graduated college. I decided to move up to Louisville with my friend, Andrea, and I started working as a preschool teacher at the Virginia Chance School. It just so happens that Chris started working there as well. He was one of their P.E. teachers. We barely spoke two words to each other for the longest time. I was in no place to start a relationship, and I didn’t even think about pursuing any kind of relationship with him. We merely worked together, and that was about the extent of it. In March, our school was going to a PD in Lexington. I had just planned on going down the night before and staying with my parents. Out of the blue, Chris asked me what my plan was for the PD, and if I wanted to ride together. I kindly turned him down, but he insisted I give him my number “in case he got lost.” It never occurred to me until later that he went to UK for a year, so there was no way he would get lost. Smooth. During the PD, there was a UK basketball game going on. They were playing Florida. The very first thing Chris ever texted me was, “Your precious cats are losing. I hope Florida beats them.” How sweet of him. (He’s a Louisville fan, unfortunately). After that initial text, we talked every single day. To me, he was just being a nice guy. We were just friends. To my roommate, Andrea, it was Chris showing a lot more interest than just being friends. It wasn’t until a couple months later when I started to let my guard down and think about what this really was. The fact that we had pursued a platonic friendship, with no strings attached, made me feel so comfortable around Chris. It didn’t take long for me to realize that he was the real deal. After our first date, I knew. I knew that Chris was the man God had put on this earth for me. He is the sweetest, kindest, most generous man. He is my best friend. I truly believe the old saying, “when you know, you know.” After 11 months of dating, Chris proposed. 6 months later, we got married! November 5th was the most incredible day. I tell Chris I wish we could do it all over again every day. It was everything I could have dreamed of and more. As soon as we got engaged, I knew I wanted to get my dress from Twirl. I have known Ty for a long time, and I knew my dress had to come from y’all! We made an appointment to get the bridesmaid dresses first. When we went in, it was magical. I knew exactly what I wanted my girls to wear, and Ty and Liz made the process so easy. I remember them asking when I was going to come in to get my wedding dress, and I was so nervous about coming in. When the time finally came, I was a nervous wreck! But Ty immediately took those fears away. The very first thing we did, before trying on any dresses, was pray. 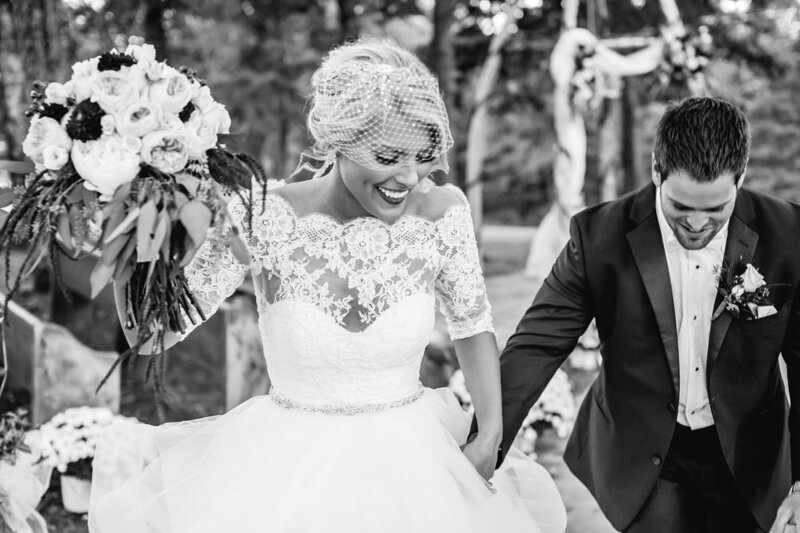 In that instant, I knew I was at the right place, and I knew that God was still in control – even with finding my wedding dress! I had sent Ty several dresses that I liked, but what I found was that I didn’t really know what I wanted. Turns out, I walked out with a dress that was COMPLETELY opposite of what I thought I wanted. 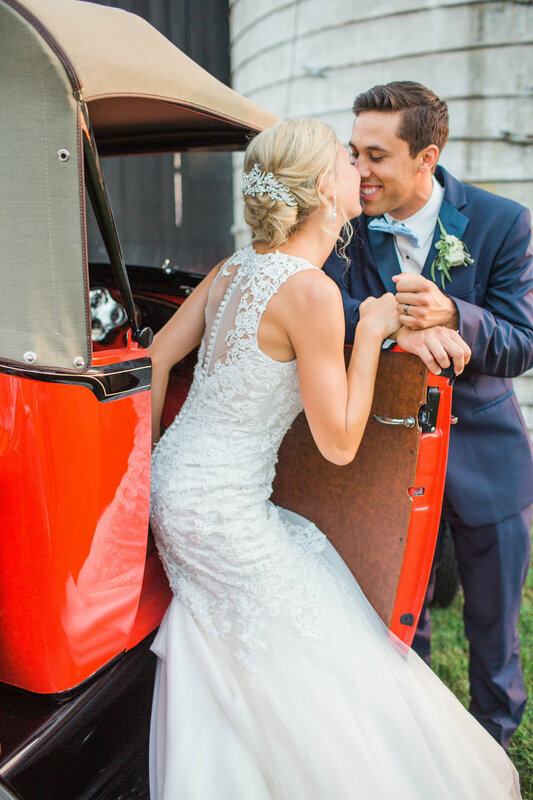 I will never forget the feeling of trying on THE dress – the Heidi Elnora “Katie Grace” dress and I knew. I knew this was the dress I wanted Chris to see me in when those church doors opened. It was even better than I could have imagined! I walked in wanting a long sleeve dress with some sparkle, and I walked out with the most gorgeous classic, simple strapless gown that I will forever cherish. 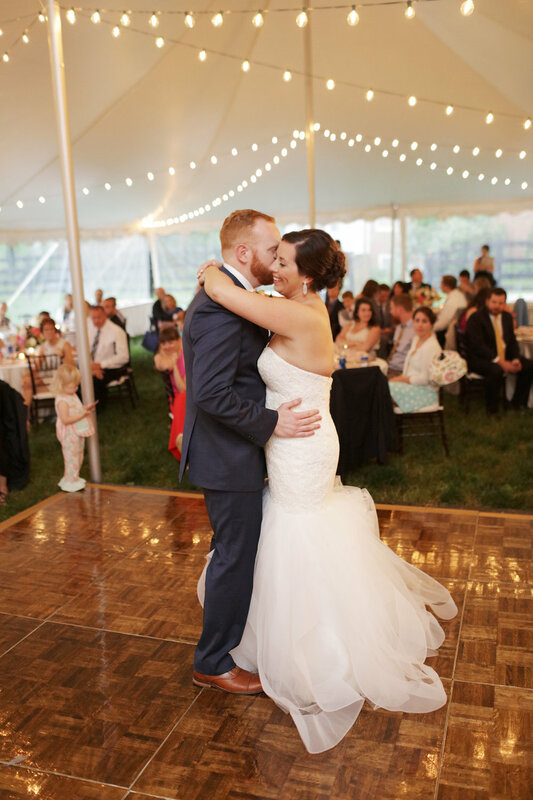 Although I wish every single day that I could relive my entire wedding day, my favorite memory happened right after our ceremony. 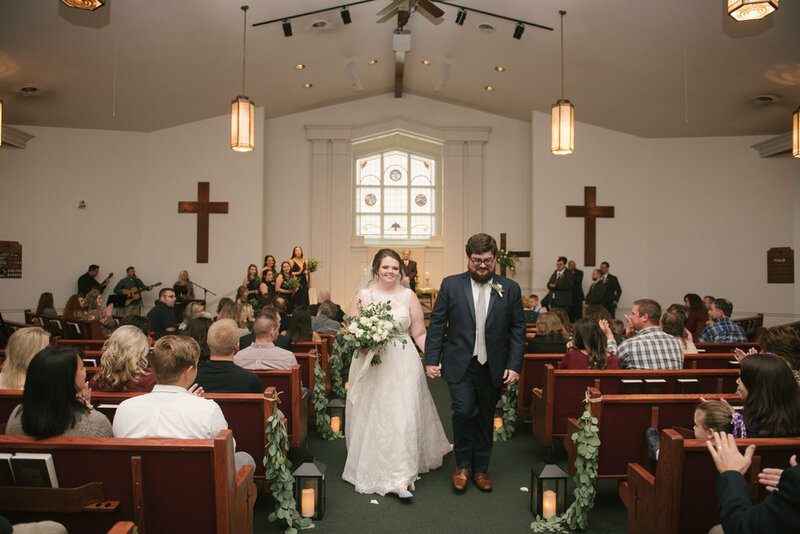 We were married at First United Methodist Church in downtown Lexington, and we had planned a “pretend” grand exit so that we could get some pictures walking out of the church with all our friends and family around us. In order to make this happen, Chris and I had to hide for a moment after we walked down the aisle as Mr. and Mrs. We hid up in this little staircase of the church balcony and it was in that moment that it hit me – I was married! I hadn’t cried the entire ceremony but at that time the tears started flowing. 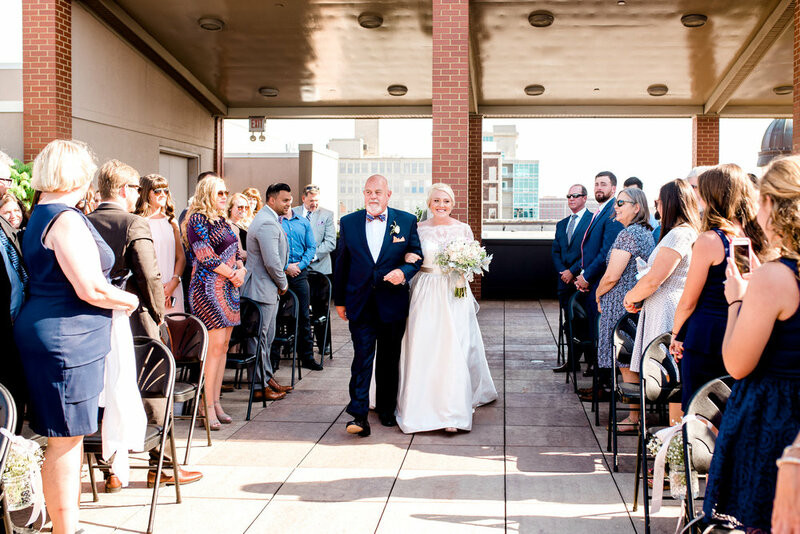 Chris and I had our one moment – our first moment – as Mr. and Mrs. It was the sweetest memory from that day. We admired our rings and had a second to breathe and take it all in. I am so grateful for that time together! The best part of marriage so far has been simply doing life with my best friend! We dated long distance throughout our eleven months of dating, and I am just so thankful that when I have a hard day, I can come home to Chris. When I have a good day, I can celebrate with him. It’s been the most wonderful (almost) year of my life, and I pray that throughout our entire marriage we continue to laugh and cry together, make traditions together, and live our life, that God so wonderfully planned together, as a family. My advice to engaged girls is delegate, delegate, delegate! SO much pressure was taken off of me by simply allowing my mom and my aunt to help make calls, email, etc. 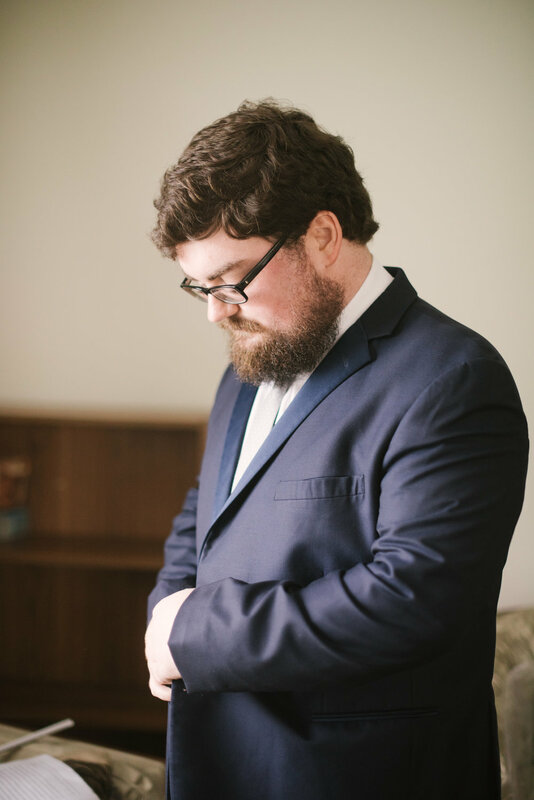 I’ll be honest- wedding planning was not my favorite thing, but having help made it a lot easier! When you allow others to help, you have more time to enjoy the beautiful season of being engaged, and no one said you have to plan a wedding all by yourself! I would get so overwhelmed trying to decide so many things, and it was making it very hard for me to enjoy. I had to take a step back, realize what was important, and at the end of the day, I would be married to my best friend no matter what music we had during the ceremony or what the bouquets looked like. That was what I cared about, and when I let some of that control go, I was able to see that and enjoy it. Tis the season for weddings! If you're anything like us, the majority of your weekends lately are filled up with wedding celebrations. It's such a joyous thing to celebrate! 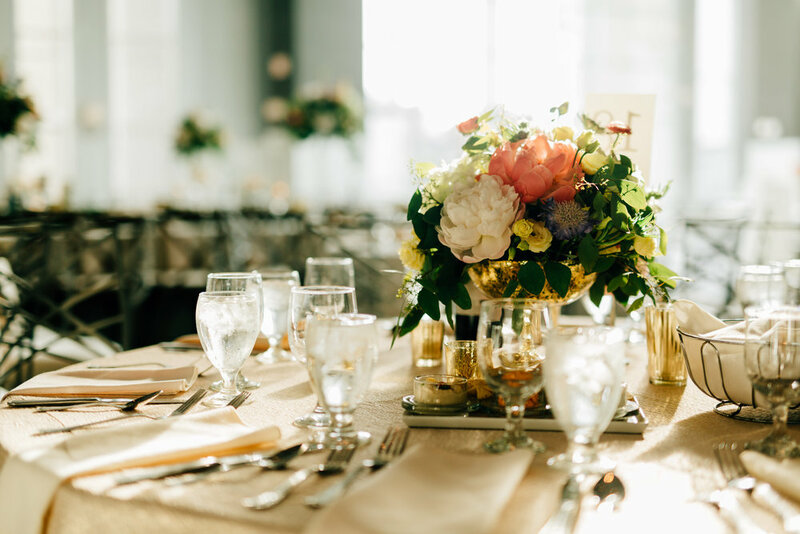 We've run into a lot people lately asking about some do's & don'ts for weddings guest so we thought it'd be a great idea to share some pretty standard etiquette guidelines for the modern day wedding guest. 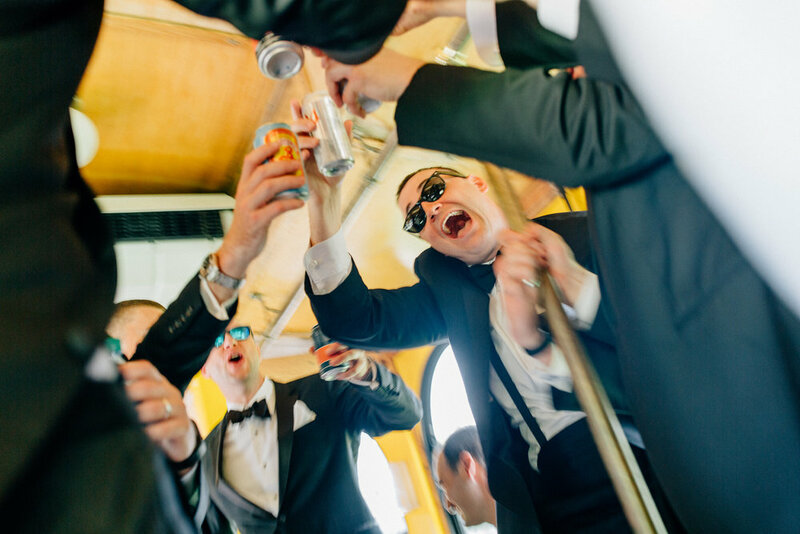 Here are our top 10 rules for being the very best wedding guest. Enjoy! - Do I have to get a gift? : Absolutely! The couple has paid for you to eat & drink on their dime so the least you can do to say "thank you" is bring them a gift to congratulate the happy duo! - If I'm invited to multiple wedding/bridal showers, do I bring a gift to every single one? 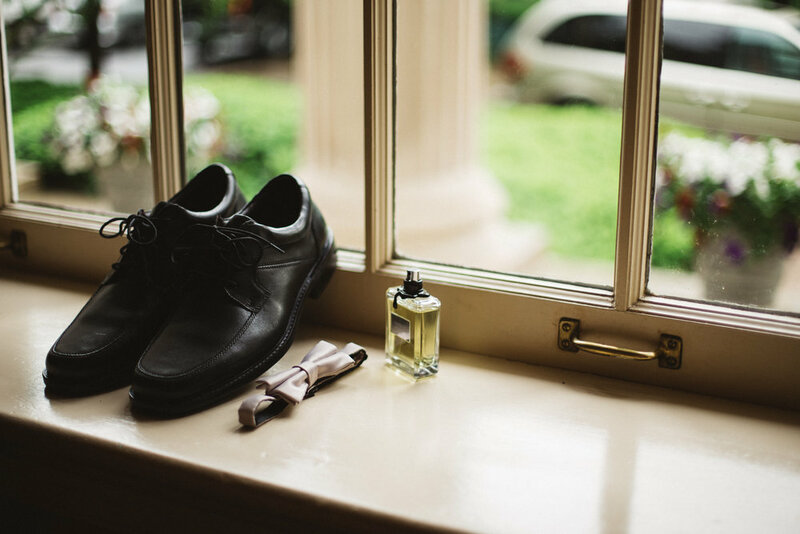 : The usual rule of thumb is to bring a gift to ONE shower and still also bring a gift to the wedding (or have it delivered to their house). - When it comes to gifts, should I stick to the registry? : We vote YES. The couple has spent a lot of time thinking through and registering for exactly what they want to make their home together. No need to go outside the lines and get them something totally random. Not to say heartfelt gifts are wonderful, if it's something personal & special to the couple then by all means gift it to them. However, for the most part, stick to the registry. It just makes everyone's life easier. - Can I always bring someone with me? : Unless a "plus one" has clearly been stated on your invitation, then you're flying solo. Your invitation will say "Jane Doe & guest" if you've been given a plus one. If it is just addressed to you then they've only allotted for you to attend the wedding. 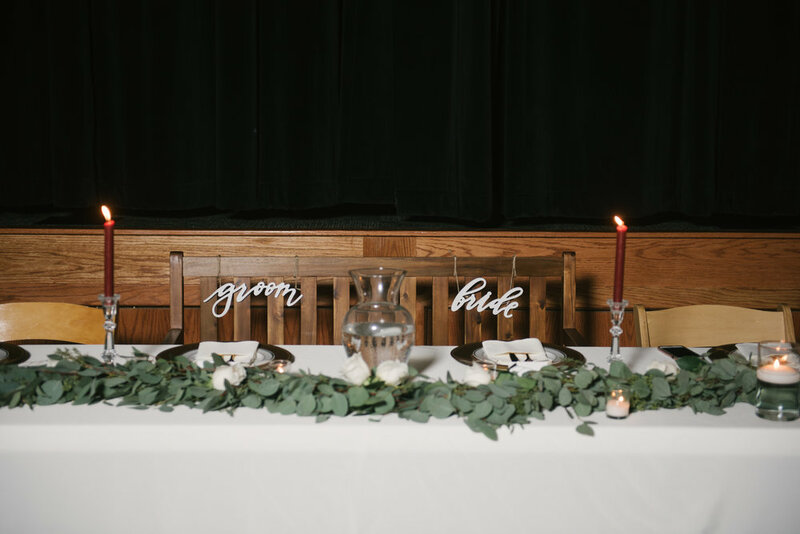 If you have a serious significant other that came into your after the invitations have been sent out, you can always ask the bride & groom if you're allowed to bring them but don't ever make the assumption that you're free to bring someone with you. - Can I wear white to a wedding? : That'd be a big NO! White is for the bride and the bride only. Don't be that girl. We would advise steering clear of "ivory, off-white, champagne, light blush" or anything in that lighter palette as well just to be safe. There are plenty of other colors to rock on that particular day so go with one of those. - What about wearing black? : Black is totally fine! 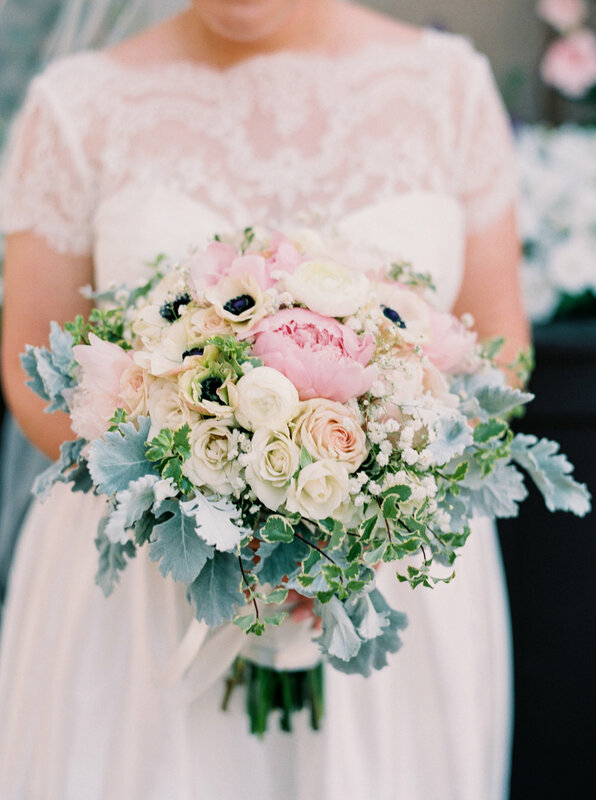 Just as long as you're staying away from the wedding colors you're in the clear in our book! - Is it rude to take pictures/videos during the wedding? : Most likely the bride & groom have spent a small fortune on paying a professional to do the photos & video of their special day so keep that phone away. Hate to break it to ya, but the professional photo/video are going to be 10000% better than anything you take on your phone or personal digital camera. ;) Let the pro's do their job while you just sit back and soak up all the sweetness right there in the moment. - When is it okay to share photos of the bride & groom? : Do not EVER post photos or videos of the bride & groom until after the ceremony is over. 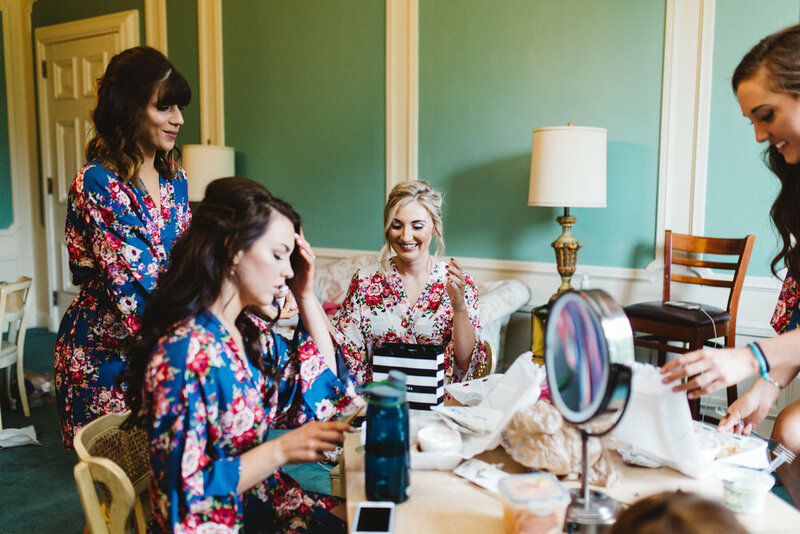 You don't want to be that person that spoils the surprise of their wedding day looks before they've even officially tied the knot! 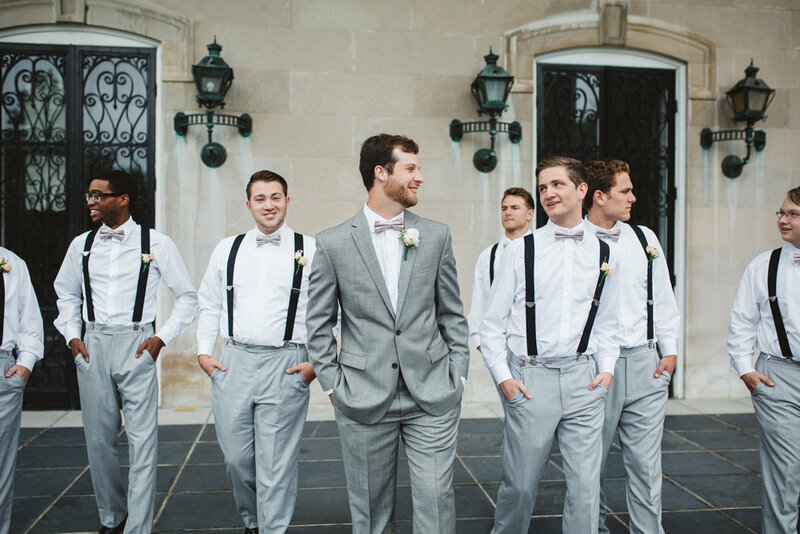 That rule goes for bridal party members too, not just wedding guests. - Are RSVPs really that big of a deal? : YES YES YES YES YESSSSSSS!! If you ask any bride two-three weeks, even one week, out from there wedding about what they're most stressed over and it's 9 times out of 10 the lack of RSVPs that have been sent in. 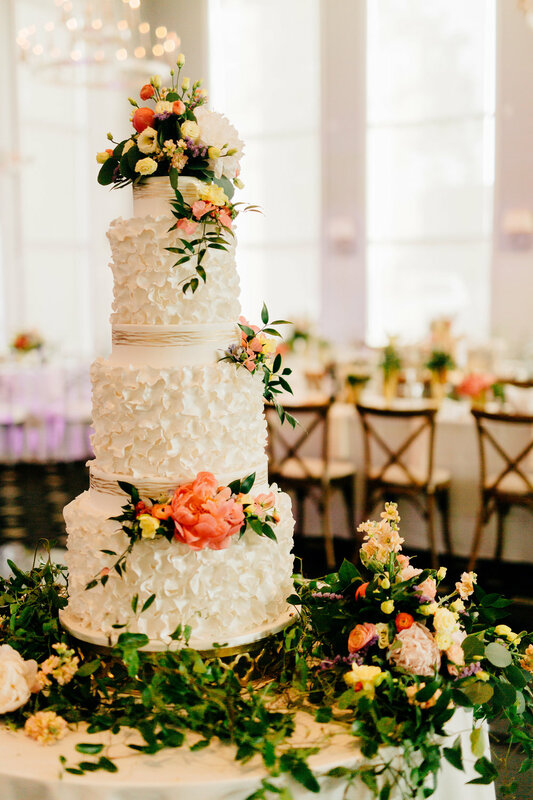 Please please please don't make the sweet bride have to hunt you down for an answer on whether or not you'll be there to celebrate her special day. Promptly send in your RSVP & make the bride and groom's life that much easier. - Can my kids come with me? : This kind of goes along with the "plus one" rule. If your kids/family are not addressed on the invitation then that's a big ole no. If your kids are welcome to the wedding the envelope will most likely say "The Family of Mr & Mrs. Doe" or "Mr & Mrs. Doe & Family." However, if the envelope just says, "Mr & Mrs John Doe" then sorry Charlie but you're going to have a find a babysitter that night. Some couples really want their wedding to be an adult-only affair so please be mindful & respectful of those wishes. 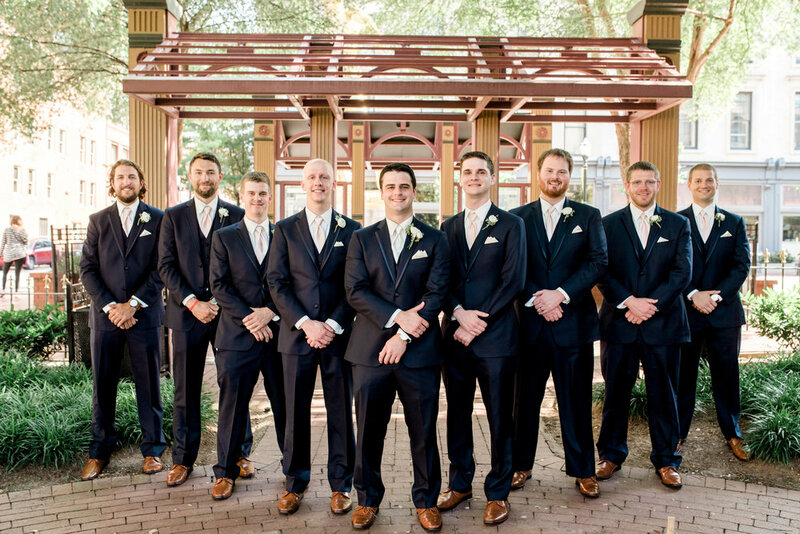 Photo by Claire & Barrett from Allison Jenk's wedding! We hope those tips helped! 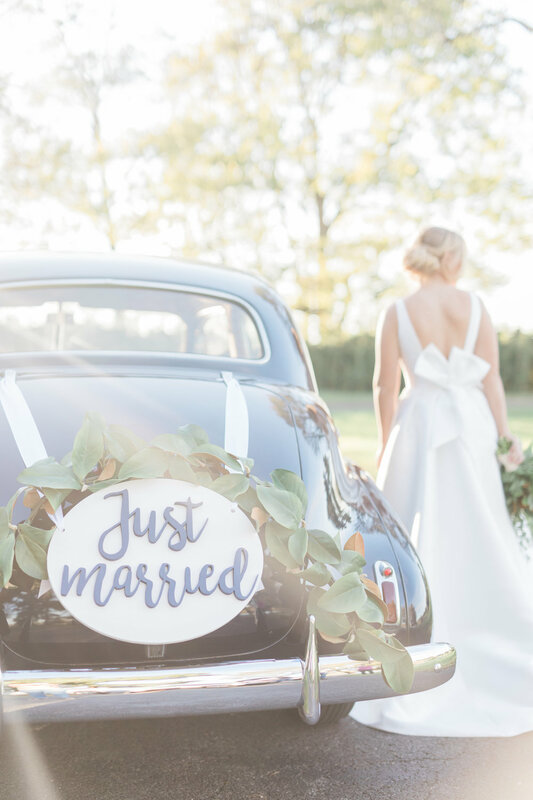 We know the wedding world and all it's "rules" can be so confusing sometimes so hopefully we set your mind at ease a little more. Enjoy wedding season, friends! Hello Friends! I know its been a little while since I wrote about my wedding planning and bridal life but that’s because I was wedding planning! It is so crazy how fast our engagement has flown by and how what felt so far away is now only 7 days away. It really just hit me yesterday how soon our wedding is and man oh man am I excited! I know that our wedding day is going to go by so SO fast that I am making it a point to soak up these last few days as a fiancée. This whole time I’ve been wondering why everyone gets so stressed when planning their wedding, but in this last month I totally get it. Now we are getting down to the nitty gritty of finalizing everything from the guest count aka tracking down all those people who never slipped that RSVP card back in the mail to figuring out how much beer and wine to buy to scheduling those last minute appointments and finally making sure everyone is going to be where they need to be when they need to be there. It’s a lot of stuff. And because of that a lot of wine has been drank in the process, oops! But at the end of the night next Saturday we will still be married even if some people don’t show up or our grandparents are a little late for pictures or if heaven forbid it rains. Y’all seriously pray that it does not rain next Saturday. Austin and I have tried to cut out some time for ourselves to relax and enjoy these final days as an engaged couple. We let ourselves enjoy a few quiet days at the lake for Memorial Day. 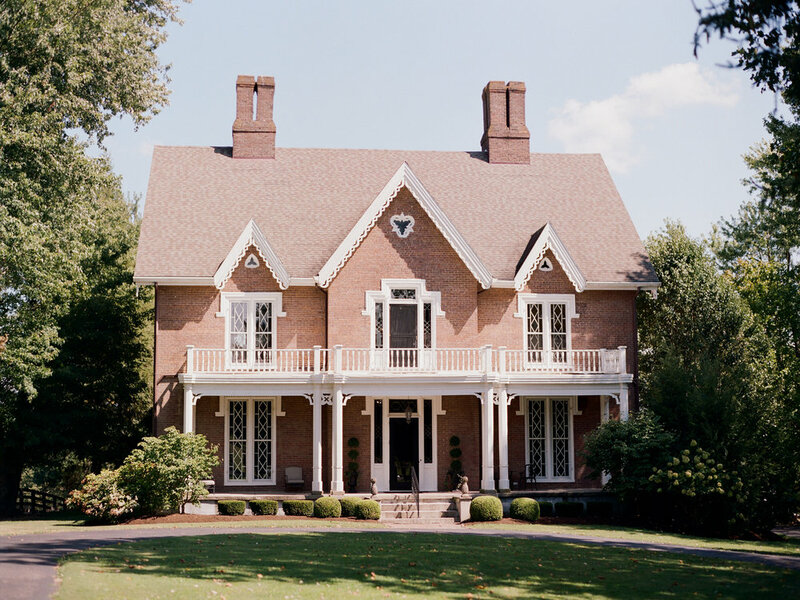 We go for evening walks and try to talk about our plans for after wedding day, like what’s still on our travel bucket list or pick out our favorite houses in the neighborhood. I think we are both a little more excited about being married and building our life together than we are about the actual wedding. 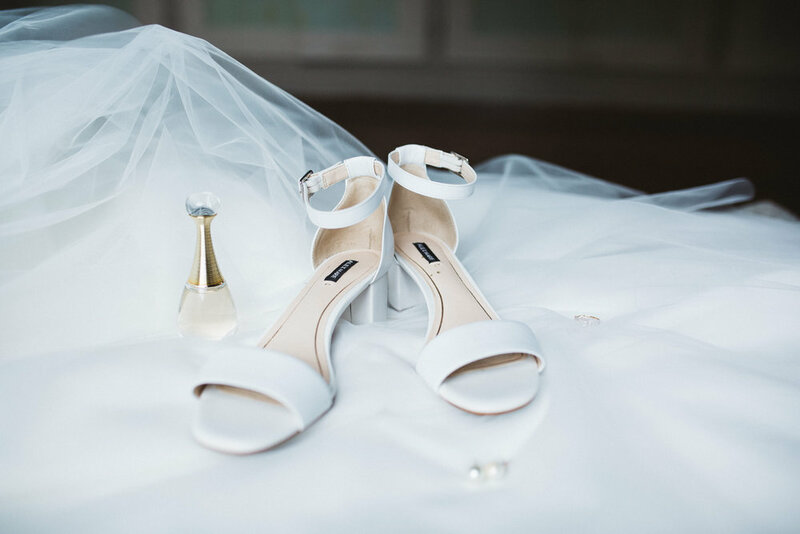 I had no idea what to expect in this last few weeks so here are some tips for all you brides for handling the craziness that is the month before your wedding! 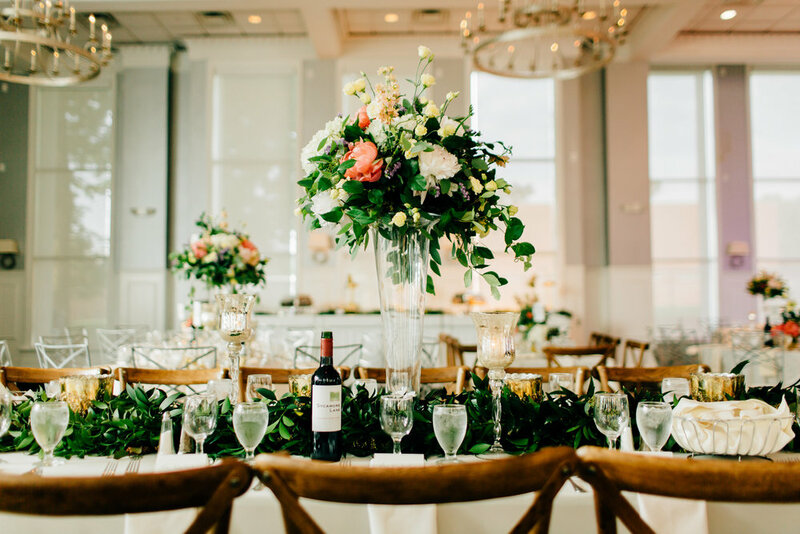 Set those “RSVP by” dates a little earlier than you think you will need, because there is nothing more stressful than trying to contact those sixty people who didn’t RSVP in a few days before the numbers need to be back to all of your vendors. Speaking of RSVP card, if you aren’t giving every guest a plus one, put ‘__ of 1 guest is/isn’t attending’ trust me, I didn’t do that and I wish I had. Enjoy your parties and showers to their fullest. Put the phone down, stop checking your email, guest counts and details can wait a day or two and it wont be the end of the world, I promise! Go to the county clerk’s office as early in the morning as you can and you’ll get in and out of there faster than it took to find a parking space. We got our marriage license yesterday, YAY!! Take some time to relax and get your skin photo ready at the same time. I love put on a facemask and take a few minutes to relax and read or watch a movie while it does its thing. Don’t stress if you didn’t hit your fitness goal or attain your dream wedding body. Your groom thinks you are the most beautiful woman in the world and you are going to rock that dress! Drink lots and lots of water. Your skin will thank you, your body will thank you. That’s just a good life tip. Talk about anything but the wedding for an hour with your fiancé daily. Talk about dogs, food, movies, sports, or whatever it doesn’t really matter but I promise he will appreciate it! 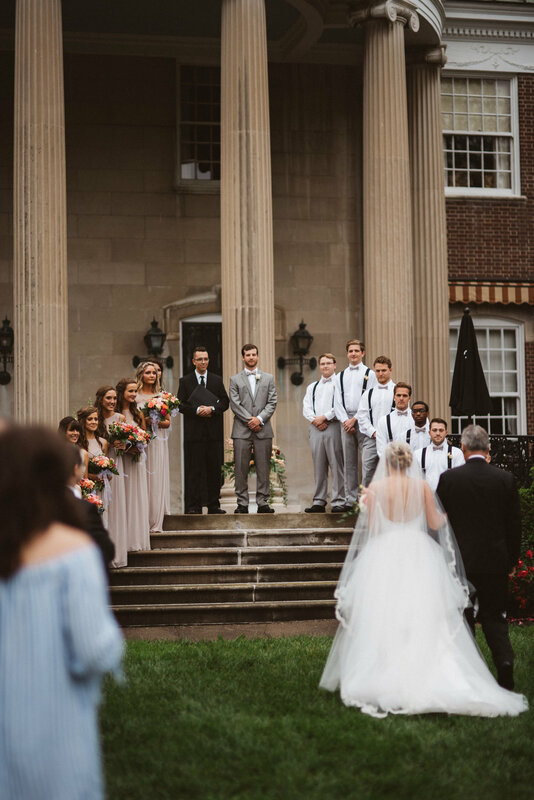 Make an itinerary for all of the really important people in the wedding such as parents, grandparents and the bridal party so everyone knows where are supposed to be and hopefully it will keep you from answering the same questions over and over again. Last but not least, take a deep breath and remember you and your honey will be married no matter what happens! We cannot WAIT to celebrate this much anticipated wedding day next week!! We've seen you as a "bride" so many times over the last 4/5 years but when we see you as a real bride... there won't be a dry eye to be found. What a joy it's been to witness your relationship with Austin develop and grow over the years. There is so much to celebrate next weekend and celebrate we will!! Can't wait until the "just married" sign marks the beginning of your new season of life next Saturday! Yay!! Guys! I (Liz Cox) am NERDING out over the Royal Wedding and can't wait to share all my thoughts and predictions about the big day with you all!! Who else is totally crazy & waking up at 4am to watch it all go down?? The majority of our team is and I'm sure our group text will be going nuts the moment we see Meghan Markle walk out in her rumored half a million dollar gown! That's right... rumor has it that her wedding dress costs around half a million dollars!!! W O W!! Speaking of the dress.. let's talk about it! Let's first start by taking note of Meghan's normal style. The girl loves all things classic and chic. She's not wild with her colors or patterns. She is usually found in neutrals, clean lines, and killer stilettos. She's not scared to wear things that make a statement but always makes sure it's never too trendy & can always be considered a classic, timeless look. She's definitely gotten a bit more conservative since becoming Harry's leading lady but she still finds ways to slip in her chic Hollywood style too. When it comes to necklines for her wedding dress, I think it's safe to assume that we won't be seeing her in anything strapless. We have yet to see that in the history of Royal weddings and I don't forsee Meghan being the one to break that tradition. I think she'll be unique with her gown but I don't think a strapless gown is how she's going to make that statement. We have a feeling she may rock a more off-the-shoulder look for the big day. The girl can rock anything though -- from high neck to off-the-shoulder.. the girl can do whatever she pleases! Here are some bridal looks inspired by some of her past red carpet looks. Now, it should be noted that we've seen Meghan in a wedding dress before! Her character Rachel Zane in Suits tied in the knot in the "Versailles" dress by Anne Barge. As beautiful as it is I don't think we'll be seeing Meghan mimicking the look for her own day. "Will Meghan wear something similar to her soon-to-be Royal family?" I know we're all asking the same thing! 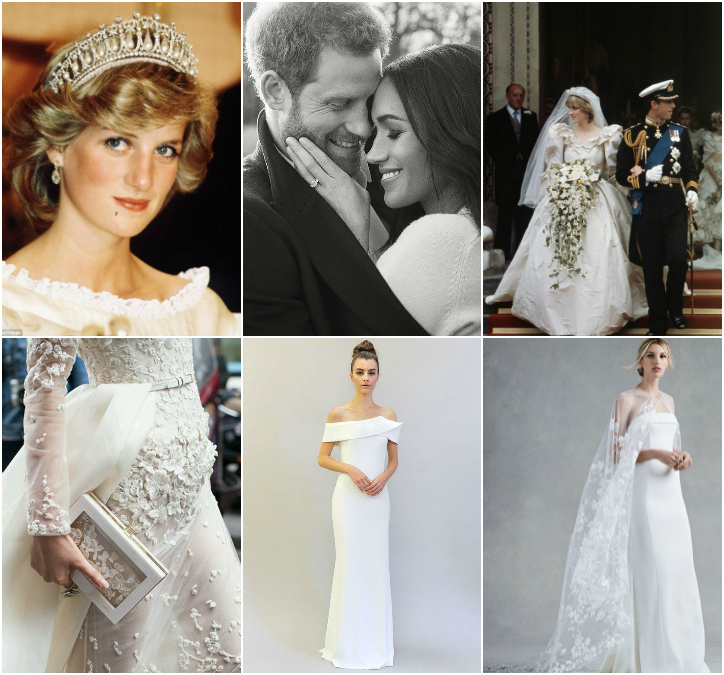 So here are my thoughts on the matter: I think Meghan will definitely wear things that are inspired by Diana, Kate, and Elizabeth but certainly put her own flair on it. I think her biggest inspiration will be from Diana so that she can honor her in a special way. That could be seen in many ways - from having modern bow details, wearing a blusher over her face (as did Kate) before the ceremony, carrying a large cascading bouquet, or maybe even having one of the longest trains in Royal history (Queen Elizabeth also had a very long train like Diana did). I have a very strong feeling that she will wear one of Diana's tiaras as a way to honor her and make Diana's presence known on their special day. Other than that though, I'm very interested to see how she incorporates her colliding worlds of American Hollywood and British Royalty. It's going to be absolutely amazing. Of that I am sure! If I HAD to say what I'm hoping Meghan will step out of the Royal carriage in, I would say this: a sleek, slightly modern off-the-shoulder gown with the wow factor of a dramatic detachable train. Historically, all royals have some sort of lace adorning their gown and I think we'll find that on the train and in the veil. Like I mentioned earlier, I think we'll see her wearing one of Diana's tiaras and carrying a similar bouquet's to Harry's sweet "mum's." Tell us in the comments below what your own thoughts & predictions are! Do you agree with us about what Meghan will wear or do you have a totally different idea?? We'd love to hear it! Cheers to love, modern day Princesses or not! It's all so fun & worthy of celebration. Xo! PS -- Check out our Out & About segment where we talked all things Royal wedding with Deann Stephens a few weeks back! 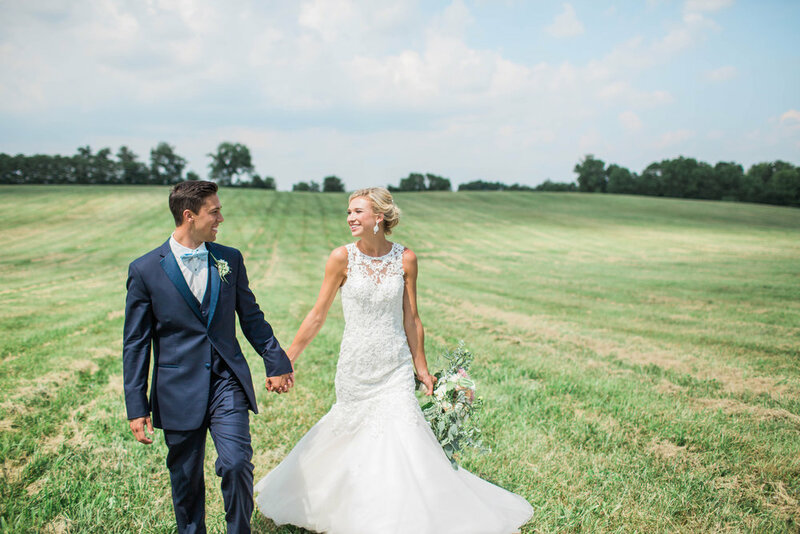 We are so excited to share this real wedding with you all! 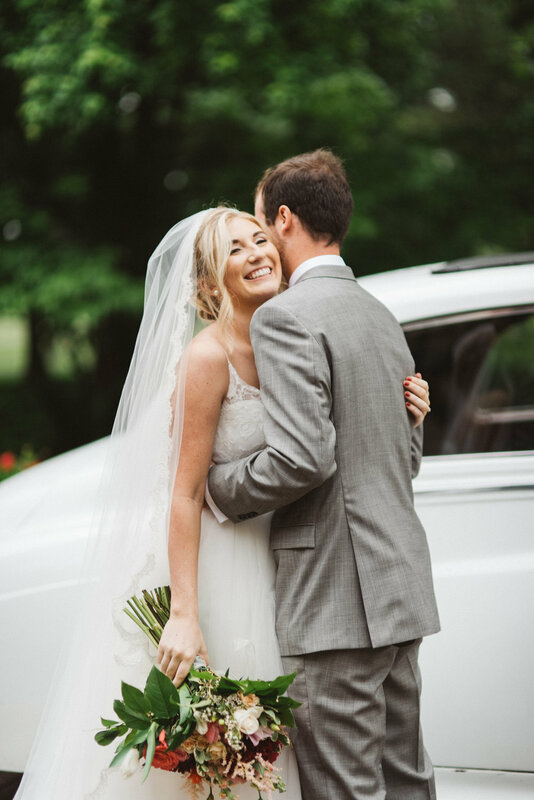 To say we adore this sweet bride would be an understatement. We got to know Ann through a cute & cozy little retail area around Clay Avenue when she worked around the corner at Omar + Elsie. 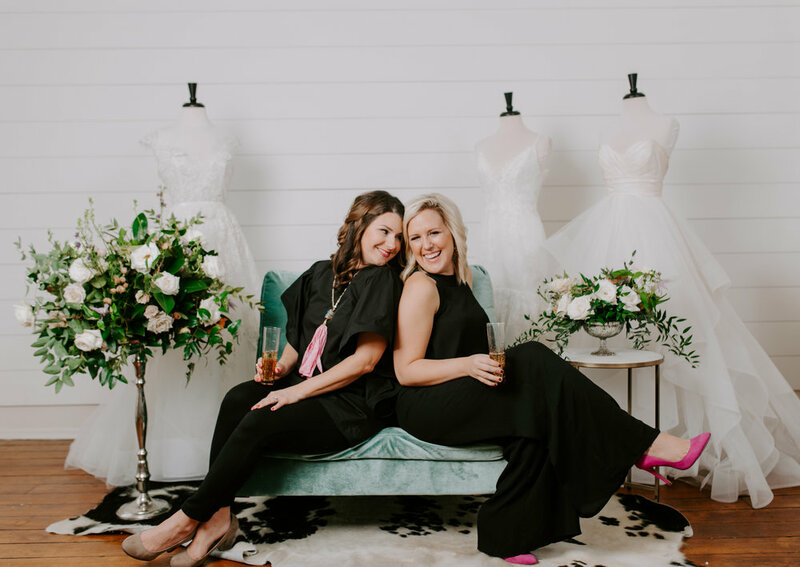 She always helped style us in the cutest clothes and accessories over there so when it came time to style her for her wedding day it was such a fun time because we knew her taste was going to be so fun! 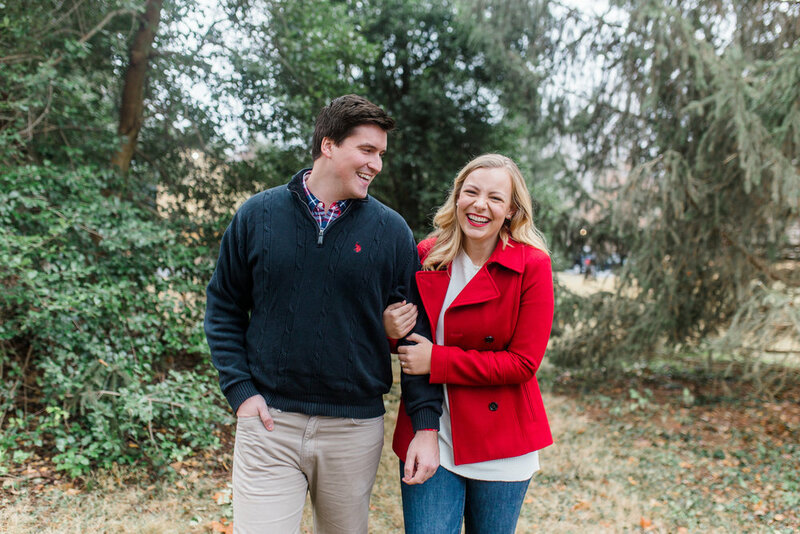 Our love story began like most romances do...at Tin Roof during a Kentucky basketball game. It's only fitting that we met at a sports bar as Abe is a UK fanatic and I am a less than enthused sports fan, at best. Nevertheless, we spoke briefly that night, then went our separate ways. It wasn't until 2 weeks and a Facebook message later (from Abe to Ann--don't let him fool you) that we arranged our first date which also happened to be the date of an impending snow storm. The snow came with vengeance and most of Lexington was shut down, but Abe was determined and despite thinking we would likely have to reschedule, he picked me up in 3 feet of snow, took me to The Beer Trappe, one of the only places open in town, and as the saying goes, the rest was history. Abe proposed 11 months later quietly, at home with just the two of us, exactly how he knew I would want it. While I certainly knew that he was “the one” and we had talked about spending our lives together, I was completely amiss that the proposal was coming that day. Much to my surprise, Abe had been planning for weeks, had asked all of the appropriate parties and told most all of my friends (props to you all for keeping your mouths shut!) about his plans; complete with a surprise engagement party for the following weekend. It was the beginning of the most wonderful time in our lives and he knocked it out of the park!! Funny enough, I told the girls before ever even coming into the store telling that I definitely wanted to try one particular dress, but was also sure to keep an open mind. I tried on several dresses, all pretty but none that made me immediately happy like the one I chose, which happened to be the one I had asked about initially! Once I had it on, I didn’t want to take it off!! Before actually trying dresses and seeing my dress in person, I was all over the place in terms of style…I didn’t really have a specific dress in mind but I knew I wanted to be comfortable and feel amazing all day. 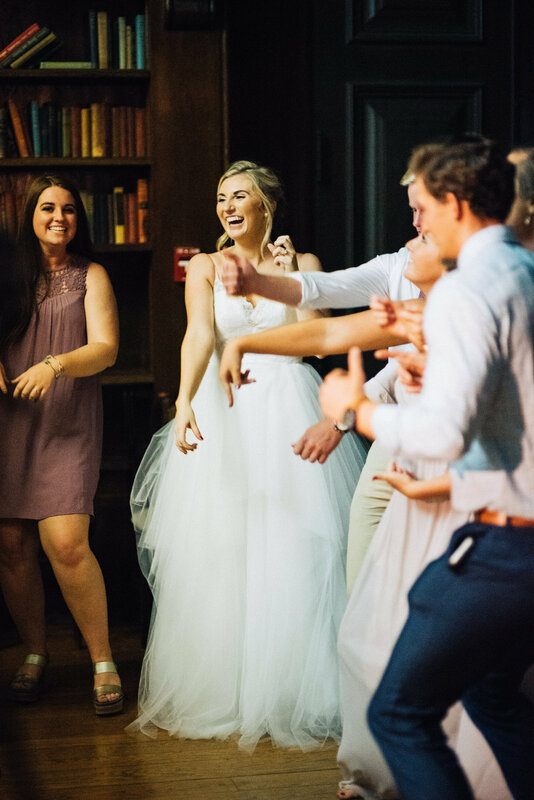 My dress did the trick—it was so light and I could move and dance the night away with no worries. The Twirl Girls made my whole experience the very best - even kindly catering to my lengthy back and forth debate about the underlay coloring - haha! Love you Ty and Liz! Ahh!! That’s a hard one! I know everyone says it, but our day was just so wonderful from beginning to end. I was calm and happy surrounded by those I love the most all day-what more can a girl ask for?? 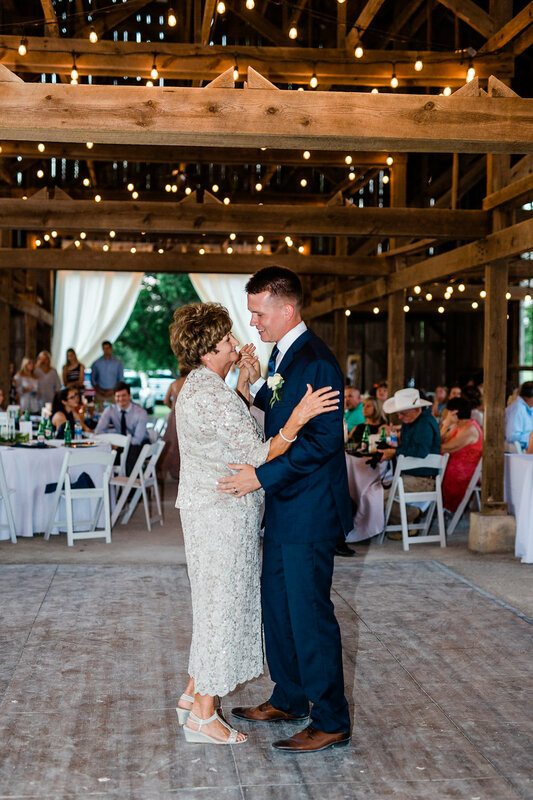 My favorite memories were the quiet moments…when my Mom and sister helped me slip into the most beautiful dress I’ve ever worn, when my dad hugged me after seeing me in my dress for the first time, when Abe turned around and told me “you look so beautiful” during our first look. All of those moments culminated as we stood in the church and exchanged vows in front of our nearest and dearest. In that moment, as we held hands and nervously recited our vows, that was a feeling unlike any other. The day was a whirlwind and so many moments are blurred into the next, but I vividly remember sitting with Abe after our vows as Darion sang “How Great Thou Art” and we just took it all in, together for the first time as Mr. and Mrs. Aside from feeling like it passed by way too fast (when they told me the band was going to play their last song, I thought it must be a joke) our day truly felt like a dream. For me, the best thing about marriage has that added sense of comfort and security…that feeling of knowing that no matter what, you have found the person who will be there through it all; the ups and the downs. I felt this way when we got engaged too but it became so much more real now that we share a last name (still getting used to that!) It’s a feeling of contentment unlike any other. Oh, and all the extra time we have together now that we’re not planning a wedding! My biggest piece of advice to anyone planning a wedding is to stay true to what you envision for your day and don’t get caught up in doing things solely because you feel like others are expecting it or because you’re comparing what you want to what someone else is doing. Have a couple of non-negotiables and don’t stress over every tiny thing; people won’t notice, I promise! Then once the day arrives, ENJOY IT. For the newlyweds: be openly grateful for your spouse and appreciate one another. No one tires of hearing thank you and I love you. Friends! We are so excited about this post from Emily today!! 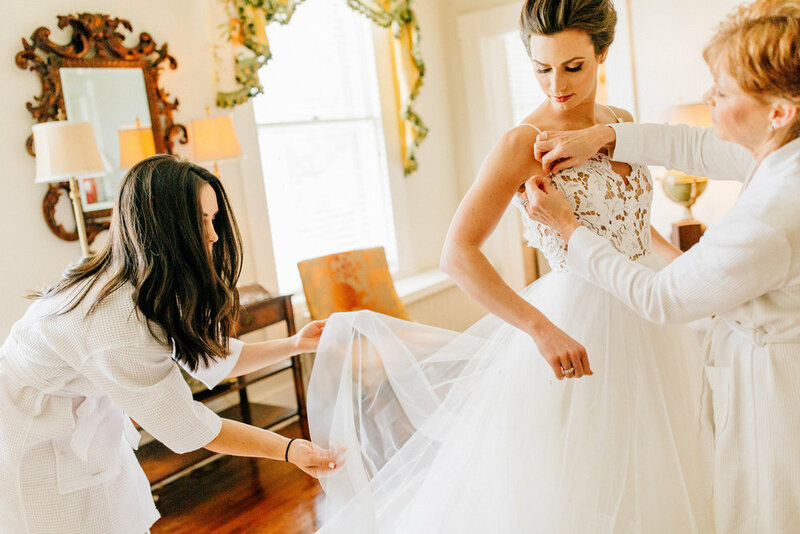 It's such a tricky situation when you have worked in the bridal world before you're a bride-to-be yourself. You either know EXACTLY what you want or you have completely no idea. 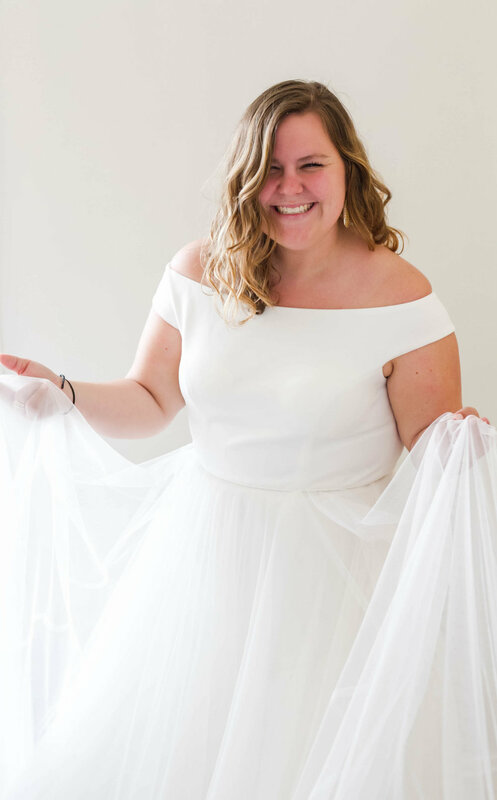 Today Emily is going to take you all through the process she went through as she finally went from being a Twirl Girl to Twirl Bride!! Enjoy! These are two sentences I hear almost everyday while I’m chatting with brides during their appointment. Both are somewhat of true, but picking out my gown was one of the hardest and the easiest decision I have had to make. I’ve been around these dresses for years and have tried on SO many for fun and styled shoots that I have lost track. This helped me learn over time what styles looked best on my body type. I guess you could say this gave me a leg up on this wedding dress shopping thing. But the bad thing about seeing so many dresses is that I get to see SO MANY BEAUTIFUL dresses. Every dress at the store may not be exactly what I wanted for my gown but there is detail in every dress that I adore. So how did I narrow down the selection of 175 dresses down to just one? 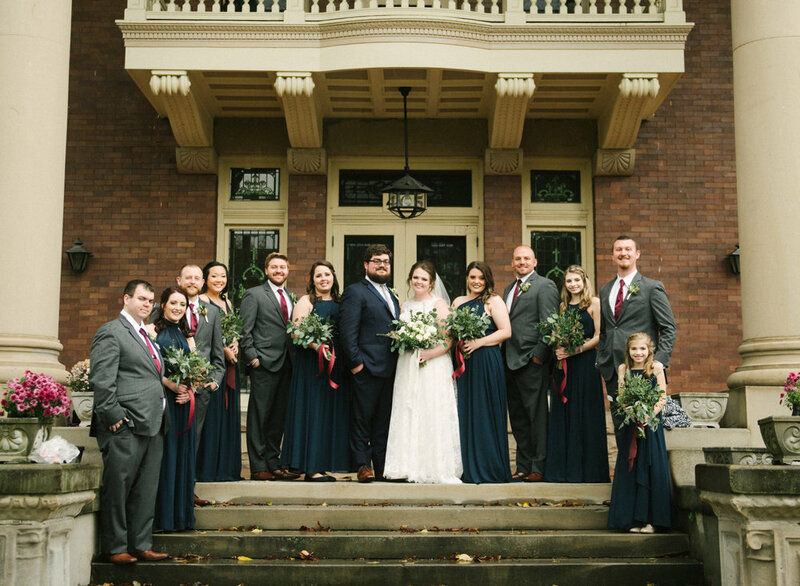 I decided to approach picking my dress like every other bride with a real appointment surrounded by the people I love and opinions that matter most to me. I scheduled my appointment about eight months before our wedding date to insure that it would come in time for alterations (We are not lying when we tell ya that those babies take four to five months to come in!). I came with my mom, sister (a Meant To Be Bride), sister-in-law (a Twirl Bride), mema, and best friend. I knew their opinions mattered to me the most and if I had too many I would never be able to decide for myself. Ty and Liz were there of course, as well as many of the other gals from Twirl. All in all, there were a lot of eyes on me waiting for me to decide. It was a little overwhelming for this gal who doesn’t love being in the lime light. If you’re like me and don’t love being the center of attention, then I recommend taking a moment for yourself in the fitting room. Make sure you have your opinion figured out about the dress before you show your group; I know how easily I can be swayed by the opinions of the ones I love. I had Ty helping me in the fitting room and I remember telling her which ones I liked, which ones I didn’t see as my dress and the one that I loved, having her on my side when I went out to show my family made me feel more confident that if I couldn’t voice my opinion about the dress clearly to my group that I had someone else there who could. Now how did I know when I found THE dress? Like I said earlier they are all beautiful dresses, but I knew coming in some of the details I wanted and features of mine I wanted to highlight and which ones didn’t need to be the star of the show that day. I love my shoulders and collar bones (is that weird?) so I wanted to make sure my dress highlighted that so I knew strapless, off-the-shoulder, or thin straps were the types of necklines I wanted to try on. I’m also really tall and my fiancé is really tall, so I wanted my dress to flatter my length rather than weigh me down. I love lace and simple classic materials so I made sure my selections had at least one of those fabrics. From there I was able to gather a good selection of dresses to try on, I narrowed it down enough to make it manageable but I also left some room to be open minded and try things I wouldn’t necessarily have picked out for myself. I tried on 7, maybe 8, dresses when I put on the one I knew I wanted to get married in. It had those detail elements that I wanted but didn’t match anything perfectly on my Pinterest board. I was surprised by how much I loved it! I had “the moment” when I could see Austin waiting for me at the end of the aisle and I would be wearing that exact dress. Everyone experiences that moment differently, for some it's tears of joy, giddy laughter, screaming and clapping with excitement, or its just a sense of peace that it’s the right one for you. My beautiful dress is now at the seamstress to be taken in here and there, to have pieces sewn on, and maybe a few buttons moved. That’s right, not even a bridal consultant’s dress fits perfectly right out of the UPS box. But that means I will have a one of a kind dress that will fit no one else but me, it will be one of its kind! Y'all, having one of our very own become one of our brides is truly the sweetest!! We can't wait for you all to see Em in her GORGEOUS wedding dress! It's unlike anything she's worn before and it is so perfectly "Em". We love you, Emily!! 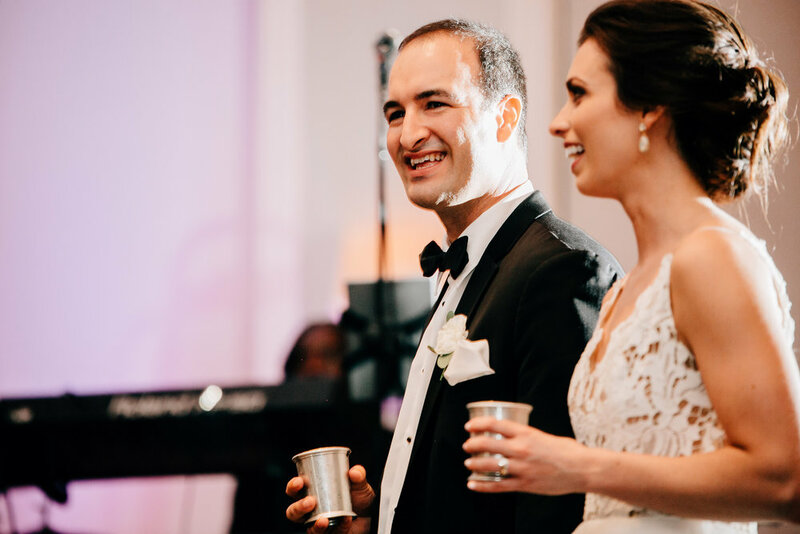 Thank you for sharing this fun part of your wedding planning journey with us. Xoxo! Happy Wednesday, friends! 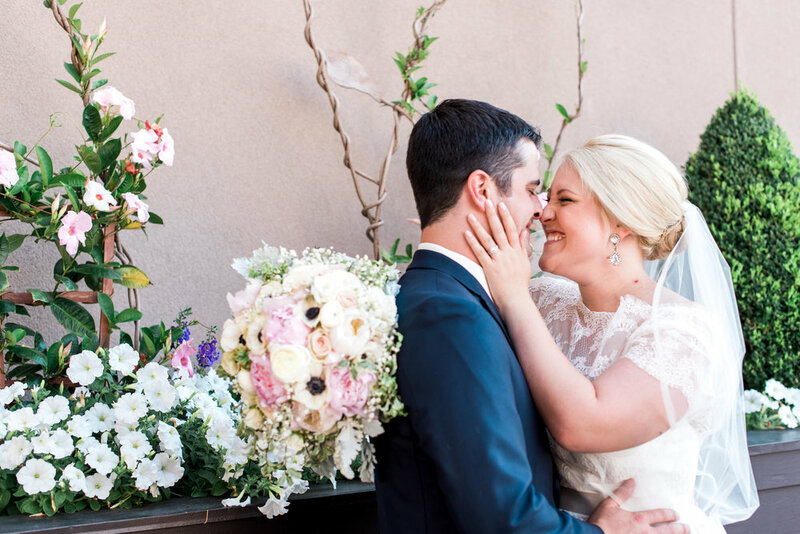 We've got a super sweet real wedding for you today and we think you're going to love it. 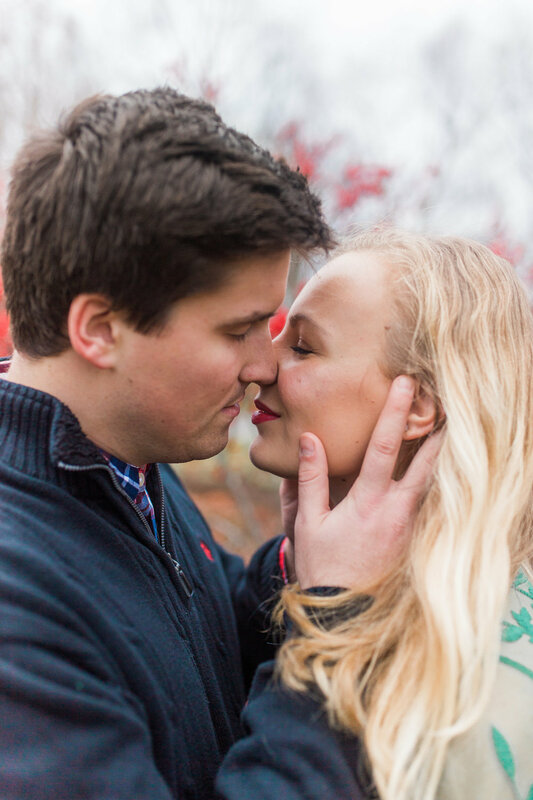 Amanda and Nick are quite possibly one of the cutest couples we've ever laid eyes on. Their day seemed to be full of nothing but laughter & love. Definitely one of those weddings you wish you could've been a guest for! We wish you all the joy in the world, Amanda & Nick! 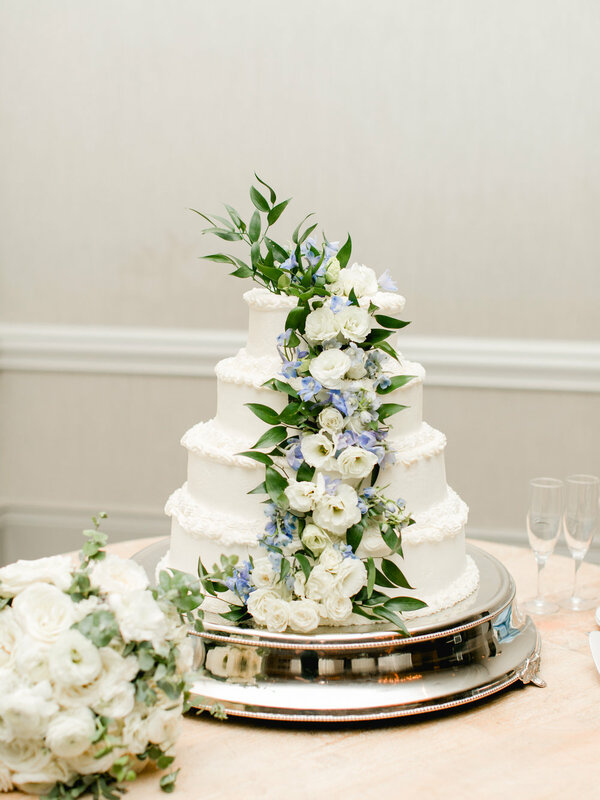 Thank you for letting us share your amazing day. Xo! Nick and I met back in the fall of 2012. I was 14 (lol I was so young) and he was 18! We met through a mutual friend and we saw each other at a bunch of basketball games, social events, etc... I remember one of the first times we got to talk to each other, he asked how old I was. When I said 14 he was like, " Wow you're a baby!"So... a couple weeks later we started texting and talking as friends and I don't think either of us intended to develop feelings because of the age gap, but we did!!! We started dating in January of 2013, maybe like 5 months after we met and we have been together ever since! I don't think we would have waited as long to get married if we had started dating at an older age, but I am so happy we got to grow up together and learn how to be in a committed relationship before we got married! On December 11, 2016 Nick asked me to marry him! We had talked about marriage a ton, so I knew it was coming but when he got down on one knee I was SHOCKED! A couple weeks after we got engaged a friend recommended Twirl and I had never heard of it before! I did my research and it seemed like a really great place and I had a good feeling about it so I decided to try there first! I called and made an appointment and when I went in I was in love! Everyone there is so kind and helpful and they make sure you are the center of attention (in a good way!) I tried on a bunch of dresses. I actually went in looking for a fitted gown, but I was open to other ideas. I ended up leaving with a classic but whimsical Hayley Paige dress! I think the reason I picked it was because it just made me feel beautiful! It was very big and dramatic and I thought it fit my personality and venue as well! 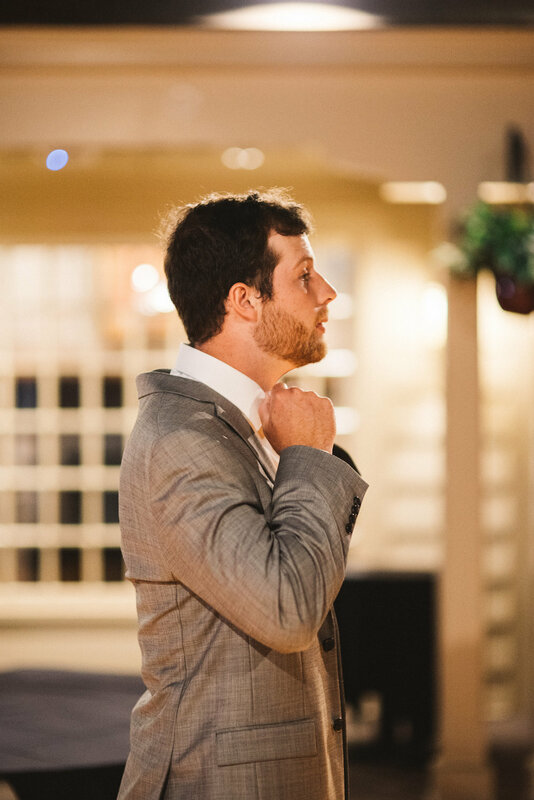 My favorite memory from my wedding was probably right before I was about to walk down the aisle. I had been stressed all day because it was raining and I had an outdoor ceremony and I was just praying that it would stop. With Jesus' blessing, the rain stopped MINUTES before my ceremony. I'm talking the guests were inside in the plan B ceremony room and were moved outside maybe 10 minutes before I walked down the aisle... I had rented an old vintage Bentley to drive my father and I to the start of the aisle but nobody knew about it except my parents, a few of my bridesmaids, and the wedding coordinator. The look on everyone's face (including Nick) as we were driving up to the ceremony spot was PRICELESS! 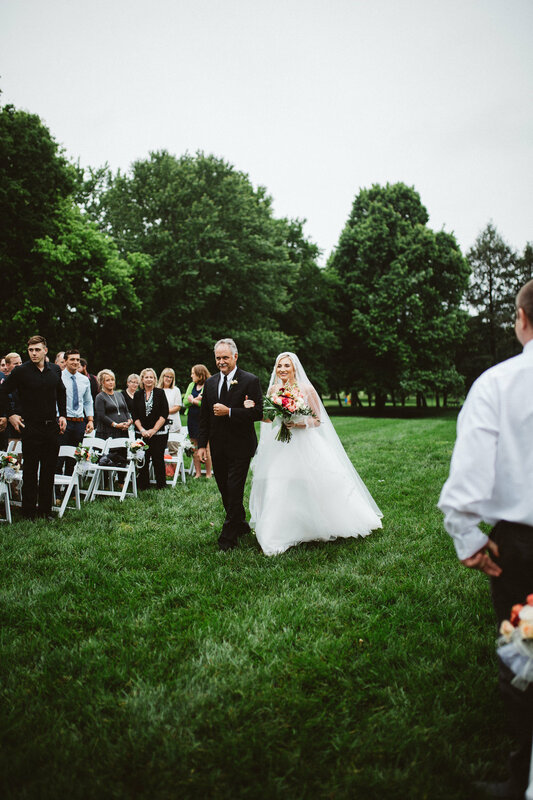 The feeling you get as you're walking down the aisle is speechless! 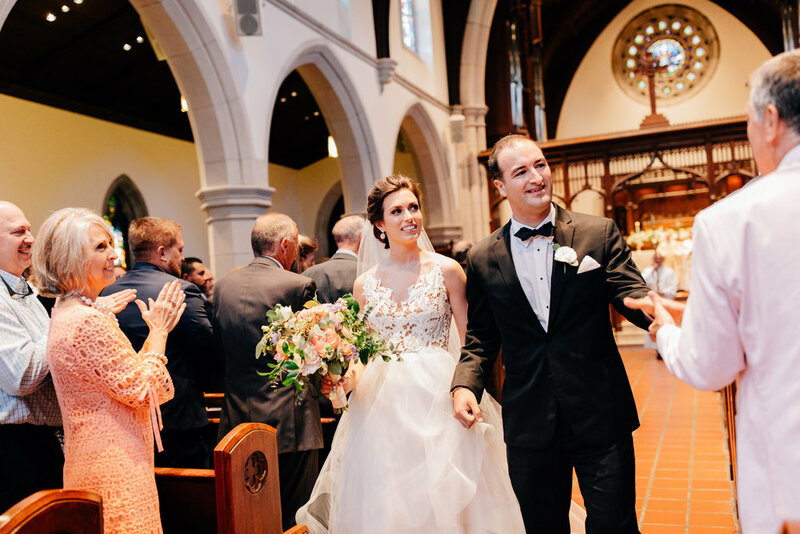 I loved all the parts of my wedding but there's no other feeling like it than walking down the aisle! The best thing about marriage so far is probably just being able to do life together and to be able to come home to your best friend every day! I know that sounds cliche but dating for 4 years isn't easy, especially when it's the end of the day and you have to go home separately. Also, I have turned Nick into an animal lover, so we now have 2 dogs and 2 cats! My biggest piece of advice to engaged gals is... don't stress! Just take everything one step at a time. It's not worth it to become a bridezilla and fine tune every last detail. Everything goes by so fast so just try your best to soak it all up, because at the end of the day you're married, and that's all that really matters! If something goes wrong you can laugh about it in years to come! Another thing that took a load of stress off my back was my wedding coordinator! She made sure everything ran smoothly and on time and she would remind me when things were about to come up. I don't have a ton of advice to the newlyweds, because I am one myself, but to just be patient with one another! Getting married to me was almost like starting a new relationship with the same person! Even though we dated for 4 years there are still things you learn about a person when you are married and for me it took a little time to get used to it! Hope this helps all the future brides-to-be!!! 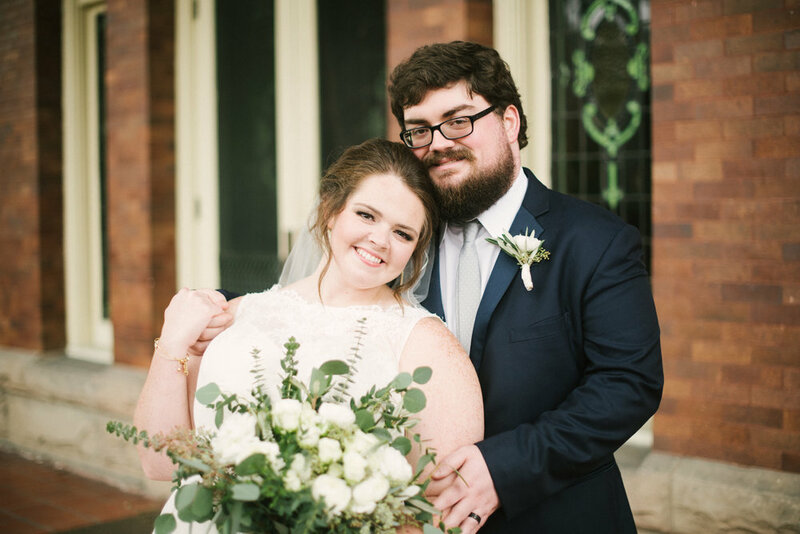 TWIRL BRIDE BLOGGER || HELLO, EMILY! Happy Friday, friends! 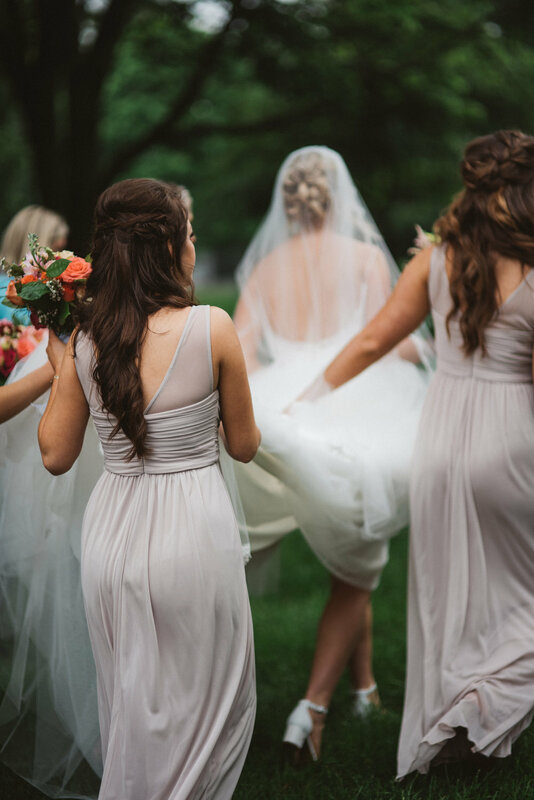 How much did you love seeing the real weddings of two of our former bride bloggers -- Allison & Mary?! 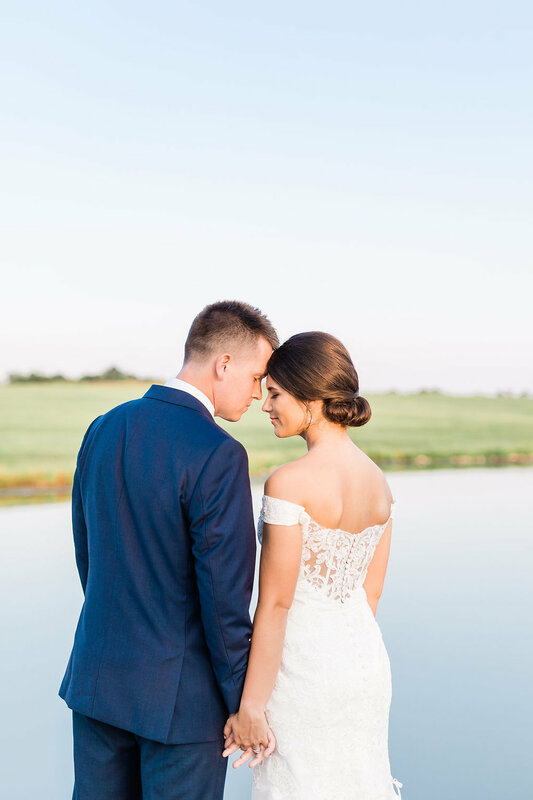 We loved getting to share their magical days with you after getting to walk with them through their wedding planning processes together. 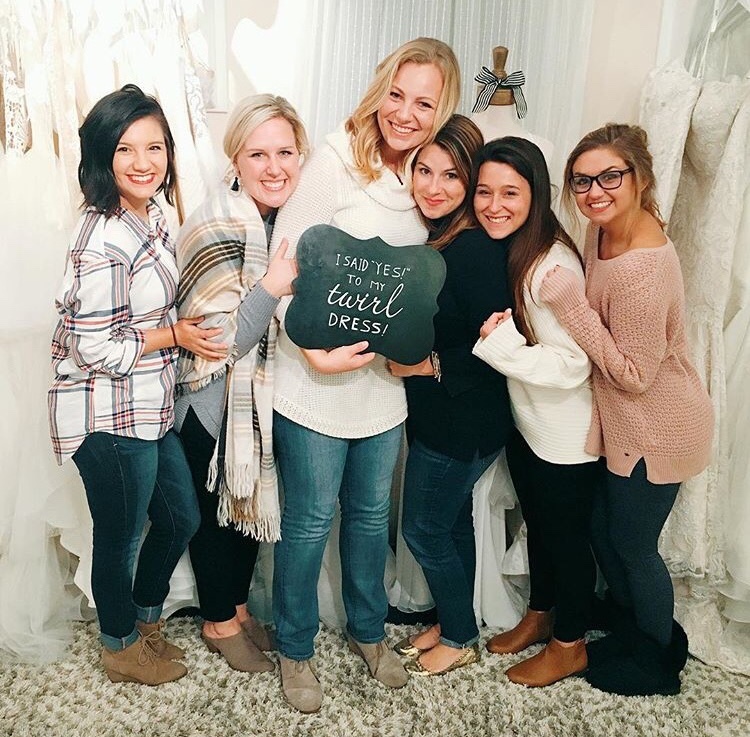 We are thrilled to announce who are our newest Twirl Bride Blogger is & we think you all will be so excited about this one!! It's our very own Twirl Girl, Emily Rhoads!! Eeeeeeeek!! How fun?! 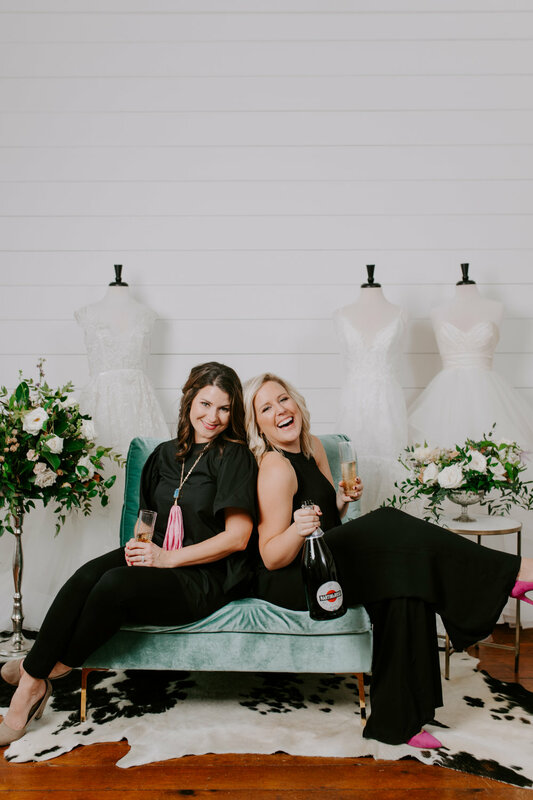 We think Em's experience will all of this will be so interesting as she is someone who works in the bridal industry and is now experiencing first hand for herself what she's been celebrating for others for so many years. We love this sweet girl & cannot wait for her to become MRS. HALL in June!! 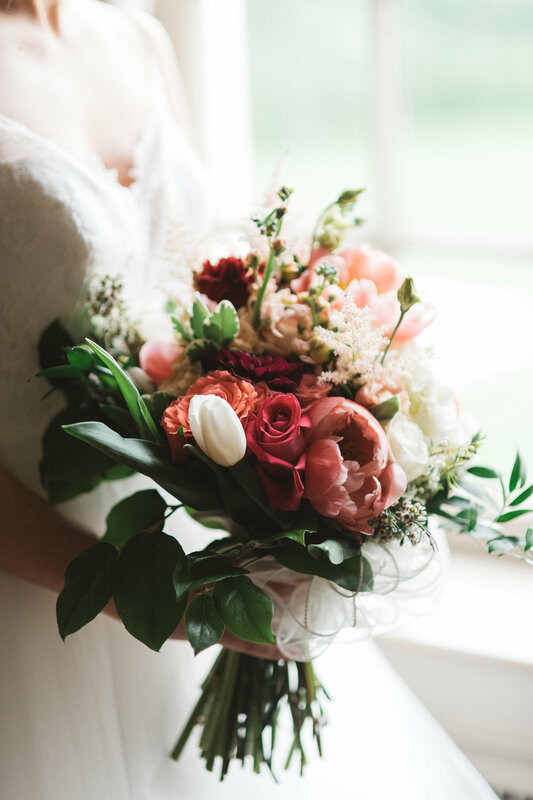 For the next several months Emily is going to be sharing about her wedding planning experiences that will hopefully inspire & encourage you along your own. So without further adieu, let's give a warm Twirl Family welcome to our sweet EMILY!! Well hello there friends! As many of you know or remember, I’m a consultant here at Twirl and I am a Twirl Girl down to my very core. For the last four and half years I have been apart of Twirl in some way. I started as an intern in the Fall of 2013 during my very first semester of college. Why Ty decided to take a fresh nineteen year old on to her team I will never know but I am forever grateful that she did! Well fast-forward four years, and now I am now a college grad and I‘m a BRIDE! What?! It still doesn’t feel real some days when I look down to see that pretty sparkly thing on my left hand. So who is this handsome fella that stole my heart? His name is Austin and I fell in love with him the moment I met him. That love at first sight thing is real folks! 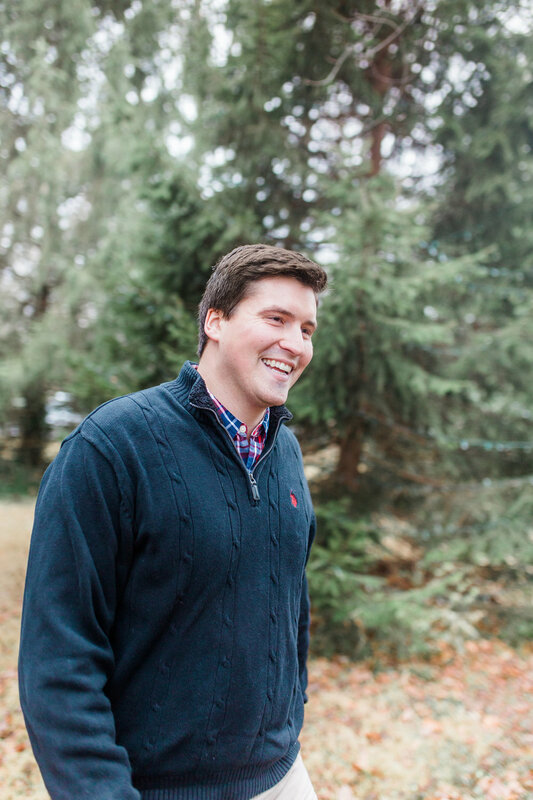 Austin and I met in February 2014 at an event at the Christian Student Fellowship on UK’s campus. I was sitting with one of my sorority sisters and low and behold this tall dark and handsome guy in a red plaid button-down walked over to us. He chatted with my friend for a minute and then turned to me to introduce himself, and y’all I can’t remember if words actually came out of my mouth or if I just stared at him in disbelief. He invited both of us to go to Applebee’s with him and his roommate for 25 cent wings and let me tell you, I have never been more excited about going to Applebee’s in my whole life! After that night, we quickly became close friends in a tightly knit group of people, but I always had the biggest crush on him and all of my friends knew, which means I’m sure he did too. For two years, yes I said two years; I waited for anything to happen between us. And then right at midnight on New Years Eve 2015/2016, all my dreams, hopes, and prayers came true when Austin nervously revealed his feelings for me and I wept because the waiting for that moment was well worth it. Our love story may not be like everyone else’s just because of how close we were before we were officially dating. I’m pretty sure our first “date” was dinner at Chipotle and going to see the Revenant, we share a mutual love for Leo and burrito bowls. We had met each other’s parents and siblings well before we were in a relationship, which lead to them not being surprised at all once it finally happened. I had actually gone on a lake trip with his family and had movie nights and pool days with his older sister. I think it was pretty obvious to everyone that Austin and I were always something more than just friends even if we didn’t know it at the time. We have been engaged since September 29th! I can’t believe it’s almost been five months; people weren’t kidding when they said your engagement will fly by. Austin popped the question right in front of the fountains at Triangle Park while strolling through downtown after dinner. My favorite part of that night was when we were by Triangle Park, he stopped and said, “Well this is a good spot.” And I was thinking a “good spot for what?” and in the middle of that thought he whips a ring box out of his back pocket and goes down on one knee. I started crying and then giggling because as a few cars drove past us they were yelling “CONGRATS” and “YOU BETTER SAY YES” out of their windows, which reminded us that we were in the middle of downtown surrounded by strangers. We are so excited to be starting our journey as husband and wife on June 9th, and honestly being his wife is the most exciting part of this whole wedding thing! I can’t wait to share my experiences as a bride and newlywed with all of you. 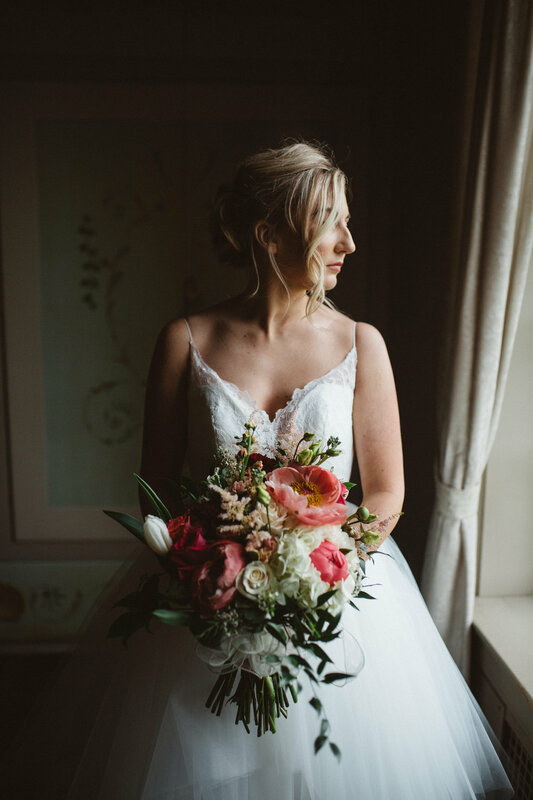 Feeling confident, beautiful and bridal are three of the most important things on your wedding day and getting into the mood of sophistication and glamorous makes it even easier to feel those ways! It’s your day and all eyes are on you, so it’s the best day to take advantage of that. Wedding gowns that express a gorgeous sophisticated-glam wedding are Twirl’s Kellie (SY6541), Anne Barge’s Blue Willow Kitt and Justin Alexander’s 8862 style. The bling embellishments and mesh corset of Kellie extenuates the confidence every bride should have, Kitt brings life and fun to the day, and Justin’s 8862 is a show stopper with the vertical lace applique and sequined underlay. 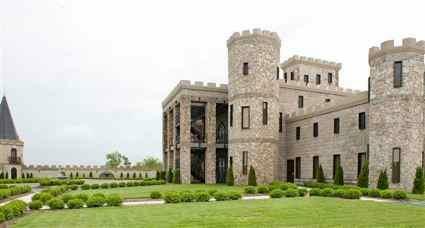 The Kentucky Castle is such a wow-factor venue that ties this theme all together. The elegance of the authentic architecture sets the mood for the day. Any sophisticated-glam event has to be paired with black ties and tight roses. 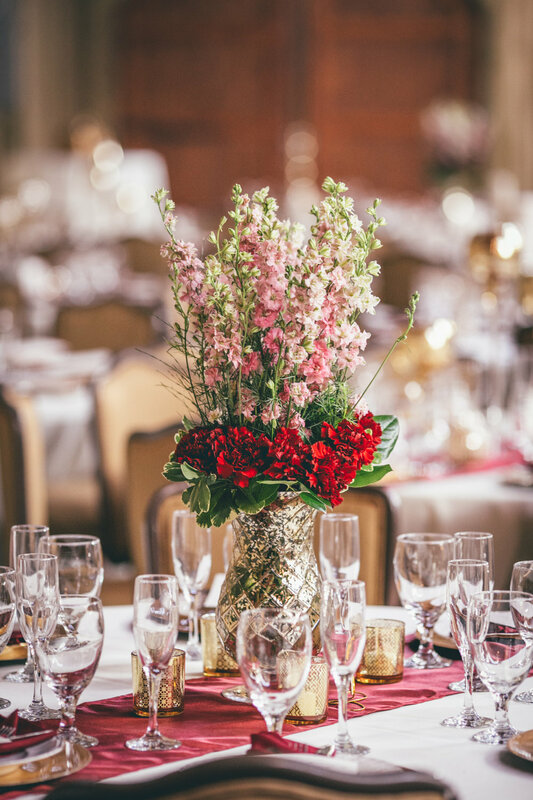 Tones of red and touches of bold black is the frosting on the cake to make your dream wedding come to life. 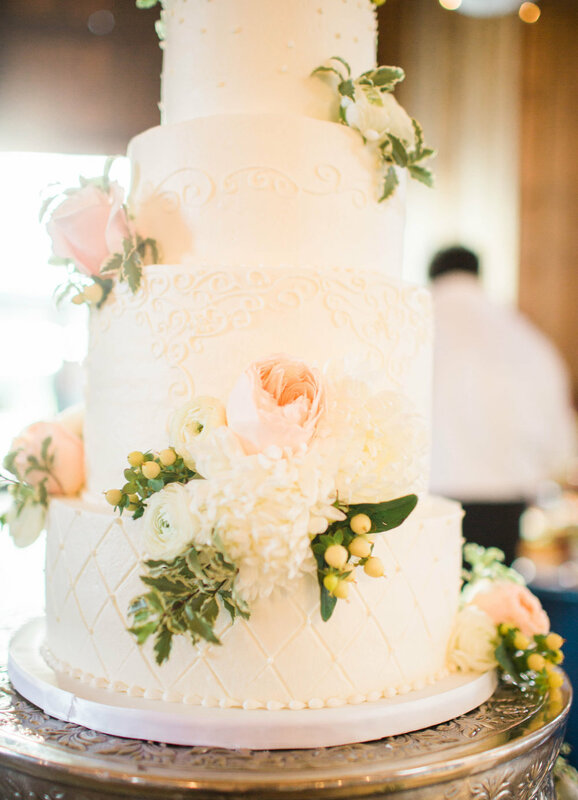 We hope you found this little piece of inspiration as you work through planning your special day helpful! 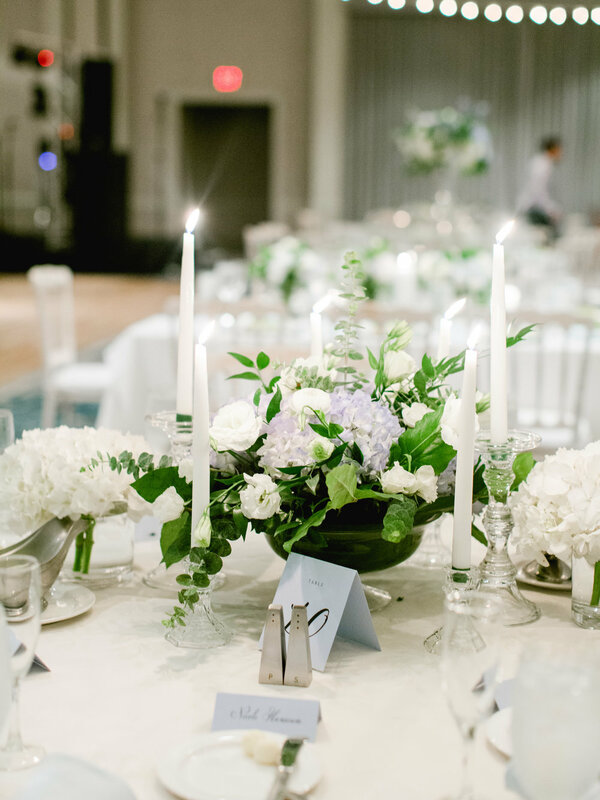 We'll be back next month with more wedding ideas for you that we think you'll love. Friends! Hello and happy Friday! We are so excited to share another real Twirl wedding with you all this month. 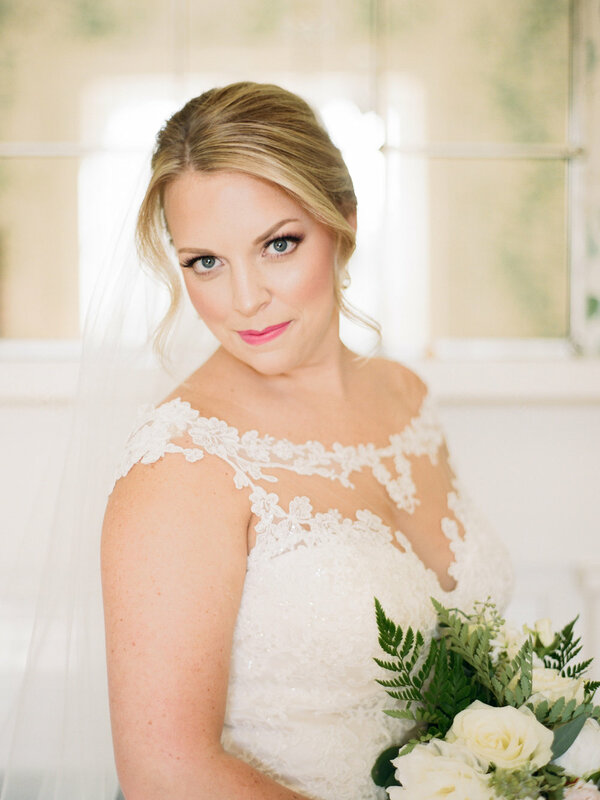 It's another one of our amazing former Bride Bloggers, Mary Rouse!! 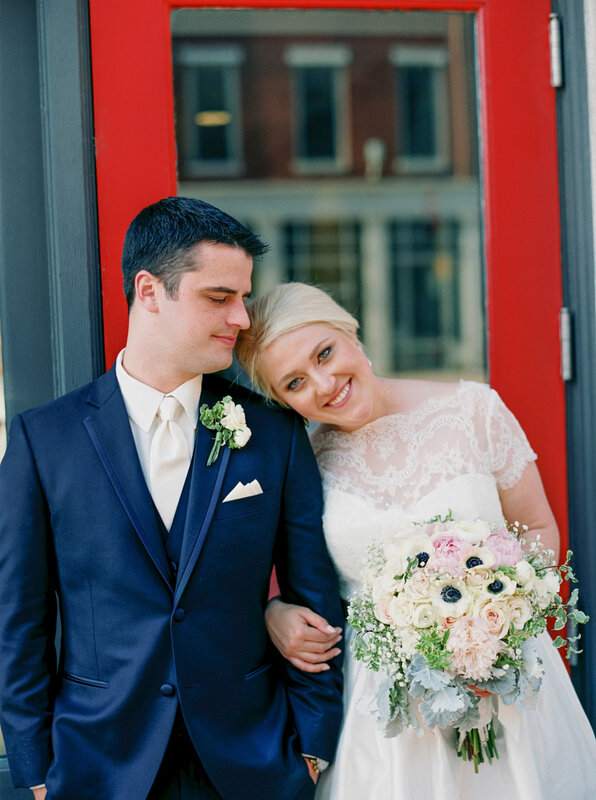 Mary shared her wedding planning process with us HERE, HERE, and HERE. 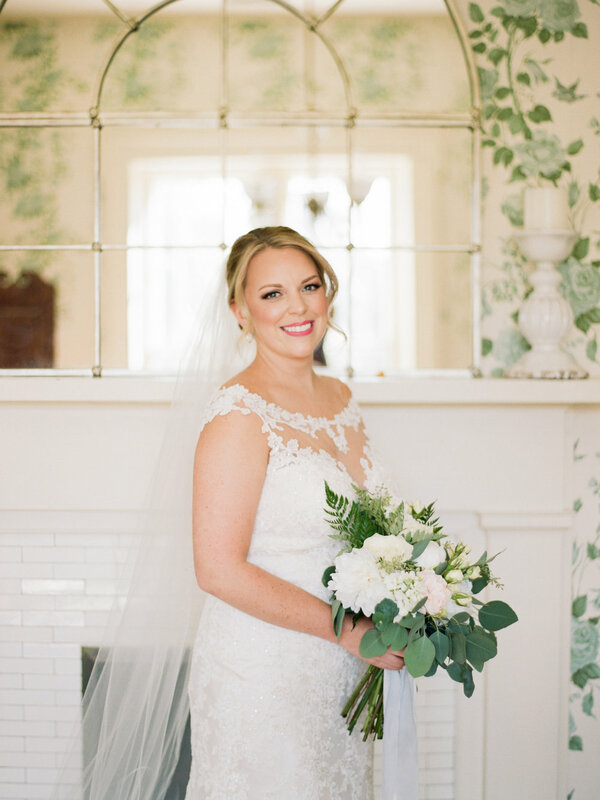 We loved having her share her love story with us and some helpful tips along her wedding planning process. 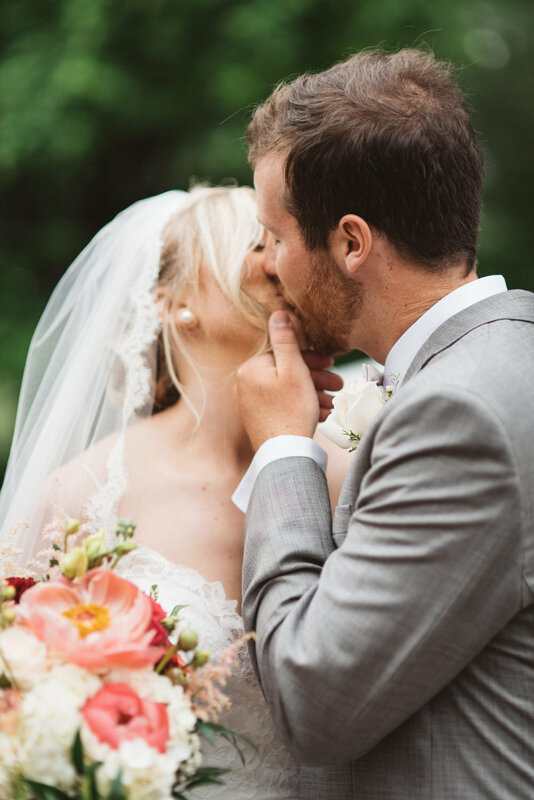 It makes our hearts SO very happy to finally share her amazing wedding day with you all! It's been a minute since they tied the knot (it'll be two years in September) but that doesn't mean reliving it is any less special. 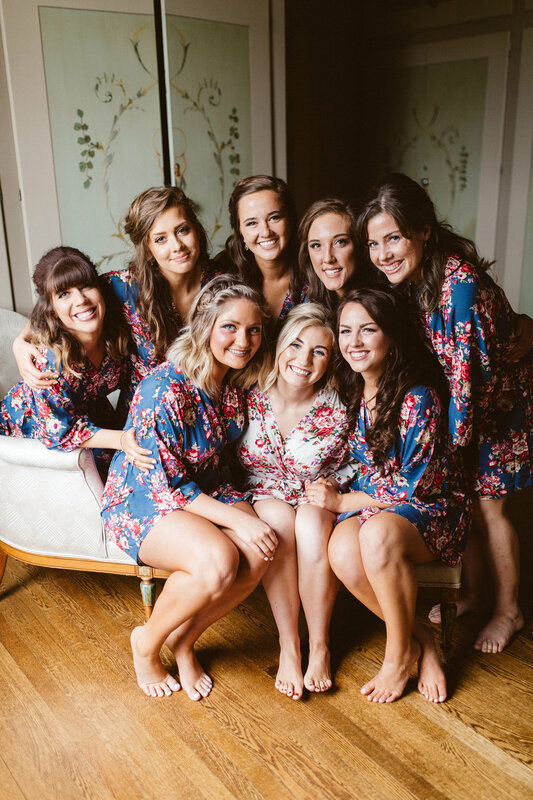 We love this girls so very much and think you all are just going to adore her perfect day. ENJOY!! Daniel and I met in October 2014 through church and mutual friends. After I became good friends with Twirl's own, Liz Cox, I was soon introduced to Daniel, who at the time, I did not know would be my future husband (I actually had a crush on another guy!). The more time I spent with Dan, the more I was intrigued by his hilarious personality and kind spirit. 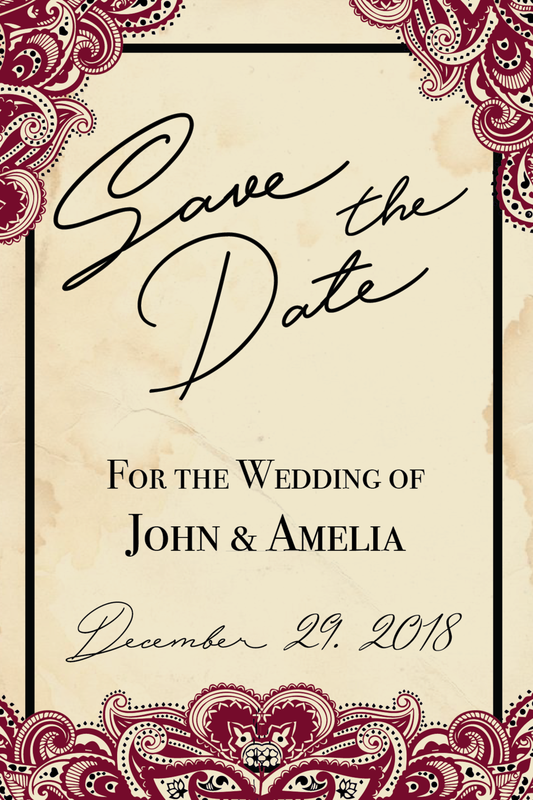 By December, we were official! We took our first date to the Southern Lights with some of our best friends and the rest is pretty much history! It was a fast "fall" for the both of us and the saying "when you know, you know" couldn't be more true for our story! 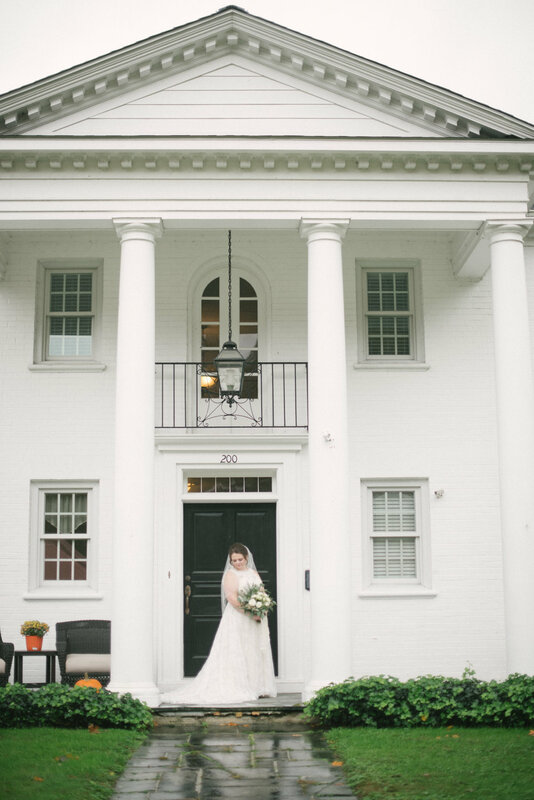 In August 2015 (only 10 months after we first met), Daniel proposed to me at the Henry Clay Estate in Downtown Lexington (watch a video of their proposal HERE). A little over a year after that, we were married! While dress shopping, I remember being so overwhelmed by all of the beautiful dresses that Twirl had in their store! It was like every dress I put on, I loved and could totally see myself getting married in! I went into my appointment having a pretty good idea of what I think looks good on me and my body type but also with a very loose grip on my expectations. To be honest, I wasn't sure what type of dress I was going to choose and that made my appointment all the more fun! I tried on SO many dresses (sorry, Liz) and I loved feeling so beautiful in every single one of them! But I knew my dress was "the one" even before I had pulled it up passed my knees. The material was so beautiful and elegant with just the right amount of sparkle; it was truly such a timeless material and style that even before it was completely on, I told Liz, "this is my dress!" That moment was my favorite memory of my dress shopping experience. 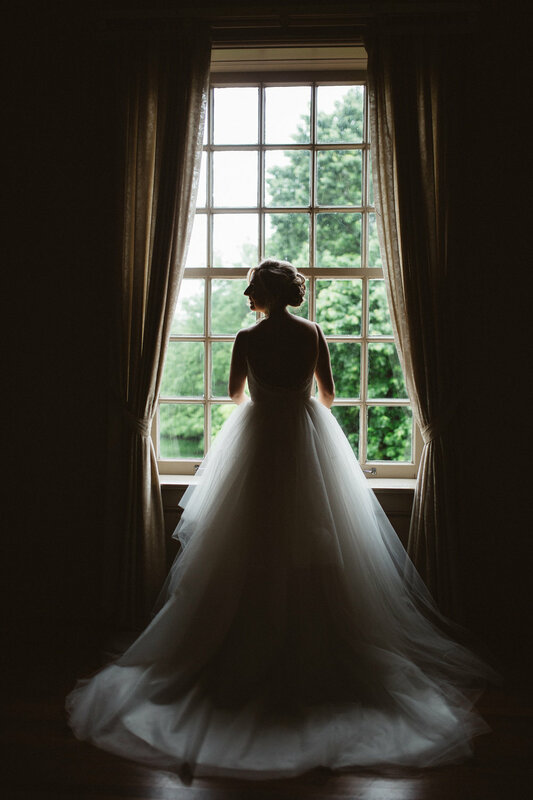 I felt so confident in my decision, after I had tried on my dress, I never put another wedding dress on! 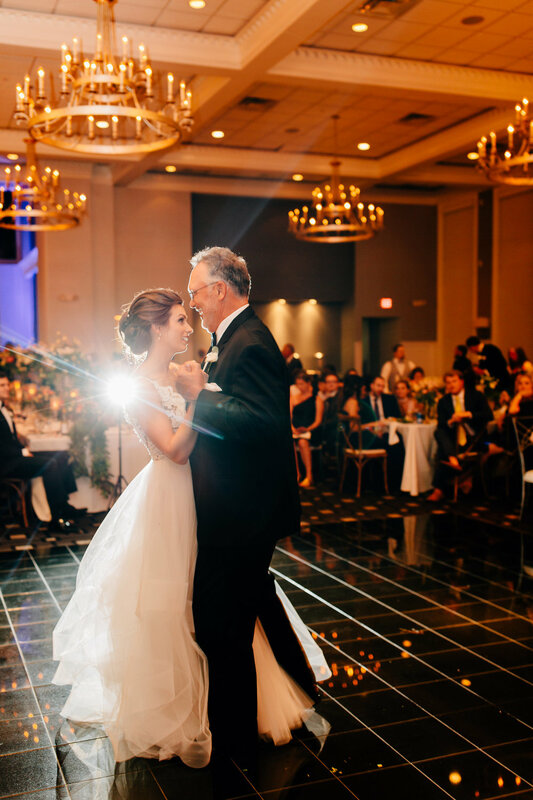 I have a LOT of favorite memories from my wedding day! I got to spend the whole day getting ready with my girls which was so fun and I got to dance the night away with my sweet groom... it was truly a magical day. But if I had to pick one favorite memory it would have to be being able to walk up the aisle as husband and wife! After a whole year of preparations for this special day, it was so much fun to finally be pronounced husband and wife! The best thing about marriage so far is always having a partner at the end of the day. I get to go through this life with my favorite person. All the highs and lows life has to offer, my sweet Daniel is by my side every single moment and it is truly a gift from the Lord to have that companionship this side of Heaven! My biggest advice for engaged gals and newlyweds would be to find a community that you can immerse yourself in. It is truly so special to have people around you that know all of your junk and love you still! Even when you are married, you still need people that will champion and encourage you and speak into your life and into your marriage (even the hard stuff!) Daniel and I wouldn't be here if it wasn't for our friends and especially on the hard days, our community is what carries us through tribulation and helps us back to still waters. Flowers- The Bride + her friends! Invitations- Personally Designed by the Bride herself! CHAMPAGNE TOASTS || GALENTINES DAY! CHAMPAGNE TOASTS WITH LIZ || HAPPY GALENTINES DAY! I thought today was as good a day as any to kick off a series I'll be sharing with y'all every now & then. We're calling it "Champagne Toasts" because we believe that every season of life can be toasted to & well lived. No matter your season, let's seek out the moments that deserve a CHAMPAGNE TOAST and celebrate accordingly. For me specifically, I am striving to live well in a season of singleness and I feel confident that many of you are walking through that season as well. I want this to be a place of comfort and encouragement to those of you that are in this same season.
. 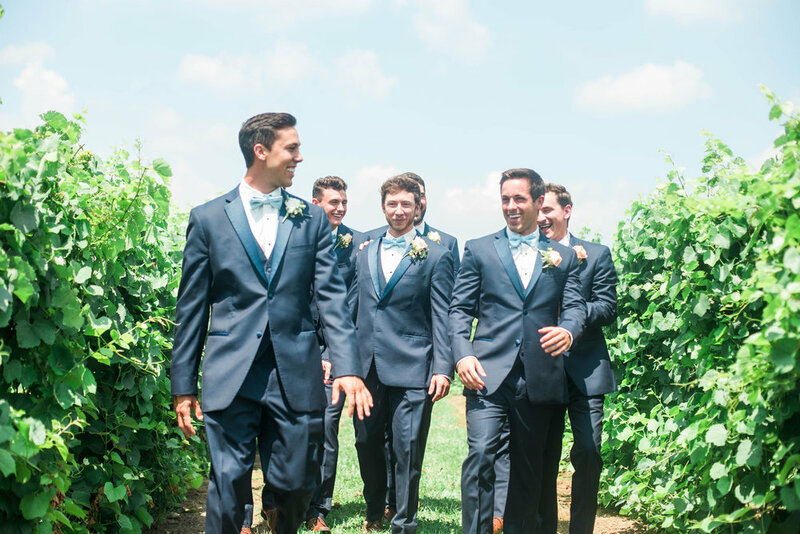 If you're on this blog, it's probably because you have some sort of interest in weddings (or your my mom... hi mom). As single women, longing for the day that we get to be a bride can be a bittersweet journey. But ladies, I am here to tell you that this season does not need to be a series of wasted days just because life looks differently than we might have hoped it would. Today I am going to be sharing about one of the greatest ways we can live well in this season of singleness: COMMUNITY/GAL PALS. Today I am raising a glass to all my gal pals that make this life so dang sweet. Community has truly been the greatest gift to me as I have walked through singleness. My girlfriends have laughed with me over terrible date stories, cried with me & wiped my tears as the pain felt too heavy, and spoken words of truth and love over me so I never lose sight of my worth. If those people aren't worth a champagne toast then I don't know who is! I pray, so deeply, that you all have people in your life that will joyfully walk alongside you through whatever seasons life throws at you. From singleness to motherhood, we need our people so that we can live well, love well, and be well. Ladies, GO LOVE ON YOUR GALENTINES!! If you see them, give them a big ole hug. If you don't see them, shoot them a text or give them a ring to tell them "I love you. Thank you for being my people." Life is far too short not to say the things that matter to the people that matter most to us. So from me to you, HAPPY GALENTINES DAY!! I love you so much & am grateful for this community of amazing women. You all are fierce, faithful, and FABULOUS! Don't let any person or circumstance make you feel differently. If you need a friend, I am here for you! Don't hesitate to reach out because I'd love to connect with you, encourage you, and love ya right where you are. Sending you BIG (virtual) HUGS & LOVE!